On a cold, windy and grey day in February, a day that seems very different to the weather we are having in June, I walked to the sites in Bethnal Green, Mile End Road and Stepney, continuing in my project to visit all the sites listed as at risk in the 1973 Architects’ Journal issue: New Deal for East London. I had intended to cover all these locations in a single blog post, however I keep finding things of interest during these walks, and I did not have the time to write the full post, and did not want to impose such a lengthy post on readers, so I split into two. A few weeks ago was the post on Mike End and Stepney, and today I am in Bethnal Green. The post covers sites 49 to 52, where I also find an 18th century boxer and an interesting walk down to Mile End Road. 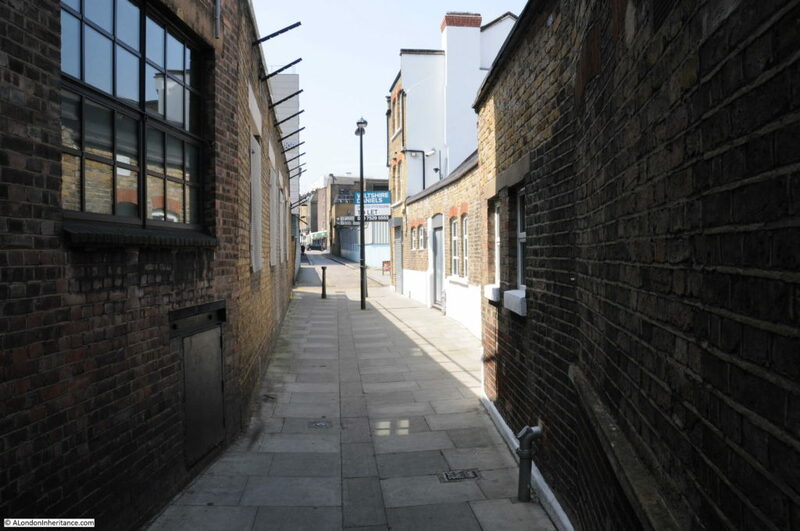 The area I will be walking is very built up, and has been since the early decades of the 19th century, however in 1746, Bethnal Green was still a hamlet surrounded by fields. 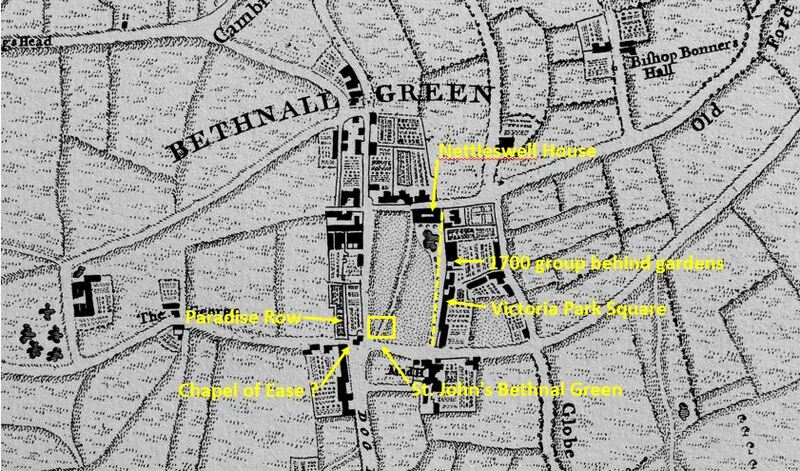 Despite the very rural nature of Bethnal Green in 1746 it is possible to see the majority of the streets and features that we can walk through today. The following is an extract from John Rocque’s 1746 map and I have labelled the key features I will cover in the rest of this post. The area today, with the locations marked. Very different from the rural fields of 1746 (Map “© OpenStreetMap contributors”). The church of St. John’s, Bethnal Green looks over this major road junction from the corner of Cambridge Heath Road and Roman Road. The church was designed by Sir John Soane and built between 1826 and 1828. One of the so called Commissioners Churches as the church was a result of the 1818 and 1824 Acts of Parliament which provided sums of money and established a commission to build new churches. 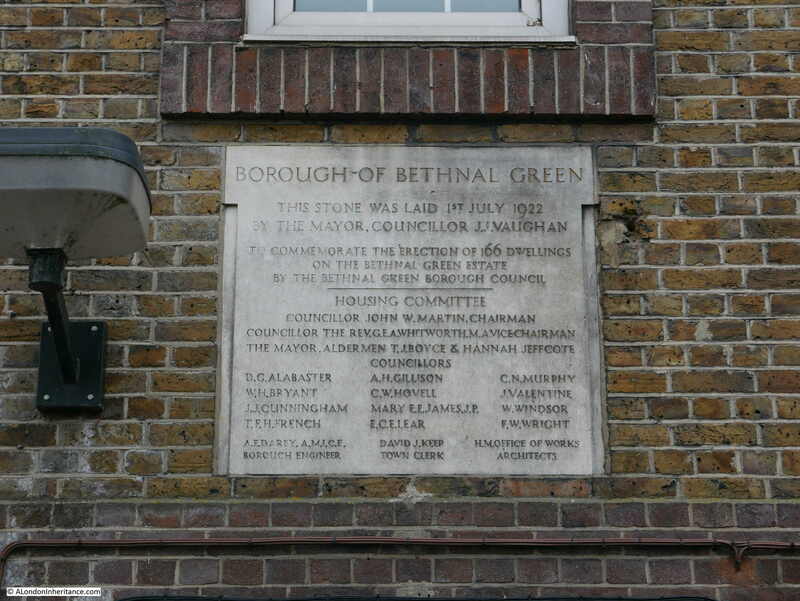 These were needed in the areas where there had been considerable population growth and Bethnal Green is a perfect example of the transformation of an area from a low population, rural landscape, to a densely populated urban settlement. 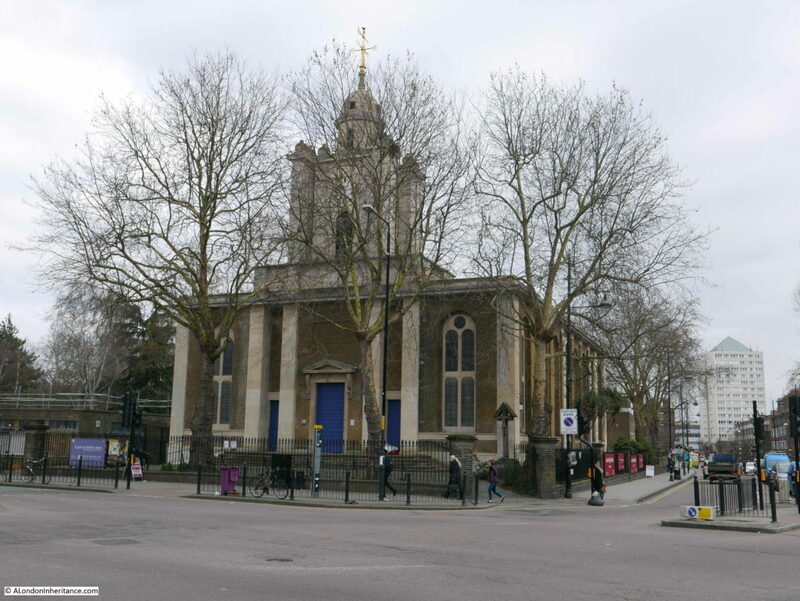 The location of the church was on open land directly adjacent to what was already a road junction in central Bethnal Green, however there are also references to there being a Chapel of Ease on the site, or close to the new church, (for example the Tower Hamlets publication: “History of parks and open spaces in Tower Hamlets, and their heritage significance” mentions a Chapel of Ease in 1617). The Roque map does show a building of some form in the road junction which may have been the Chapel of Ease, although this is just speculation at this point and needs some further research. The church was damaged by fire in 1870 with much of the interior and the church roof being destroyed. The church was reopened the following year after restoration, which included new bells cast at the Whitechapel Bell Foundry. The church did suffer some damage during the last war, fortunately not the major level of damage suffered by many other east London churches. The church was closed on the day of my visit, however it is good to see that the church is still an imposing building overlooking this busy junction, even on a grey and cold February morning. 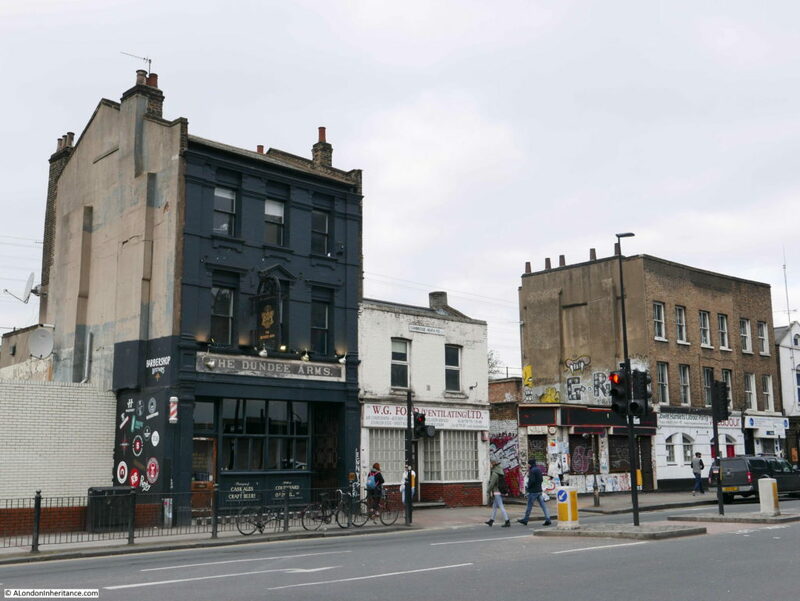 There are newspaper references to an east London Salmon and Ball going back to the 1730s, but they do not specifically confirm that they refer to the pub in Bethnal Green. “The Salmon and Ball, by the bye, figures prominently in more than one historical scene in the turbulent days of Bethnal Green Weaverdom. Apart from that, however, it is a tavern sign sufficiently incongruous to awaken curiosity. The early silk mercers adopted the Golden Ball as their sign, because, in the Middle Ages all silk was brought from the East, and more particularly from Byzantium and the Imperial manufactories there. And at Byzantium the Emperor Constantine the Great adopted a Golden Globe as the emblem of his imperial dignity. The Golden Ball continued as the mercer’s sign until the end of the Eighteenth Century and then it gradually passed to the ‘Berlin’ wool shops, and – conjoined with a fish or other animal – its was favourite sign for Taverns in the silk weaving area. No idea if this is the true origin of the name, but an interesting possibility. 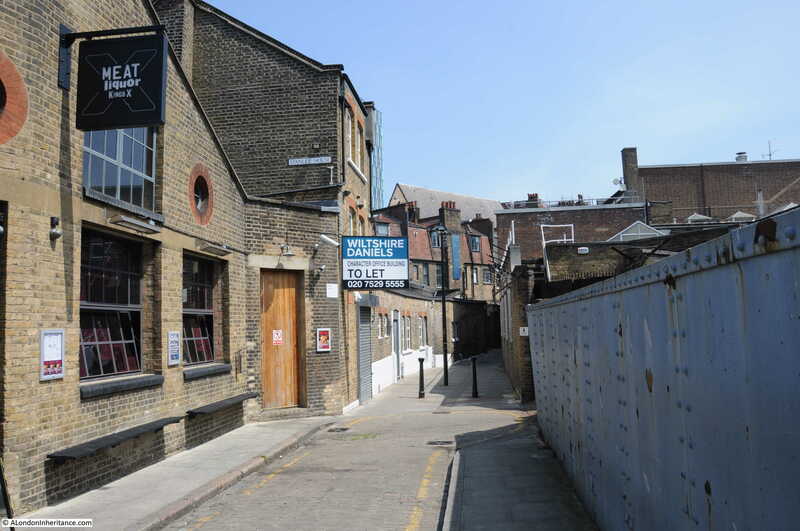 This location was just opposite the church, a narrow street that runs parallel to Cambridge Heath Road and that goes by the name of Paradise Row. For the main part of the street, houses run along one side, with the opposite side formed by Paradise Gardens, which in February really did not live up to the name. Daniel Mendoza was a fascinating character. 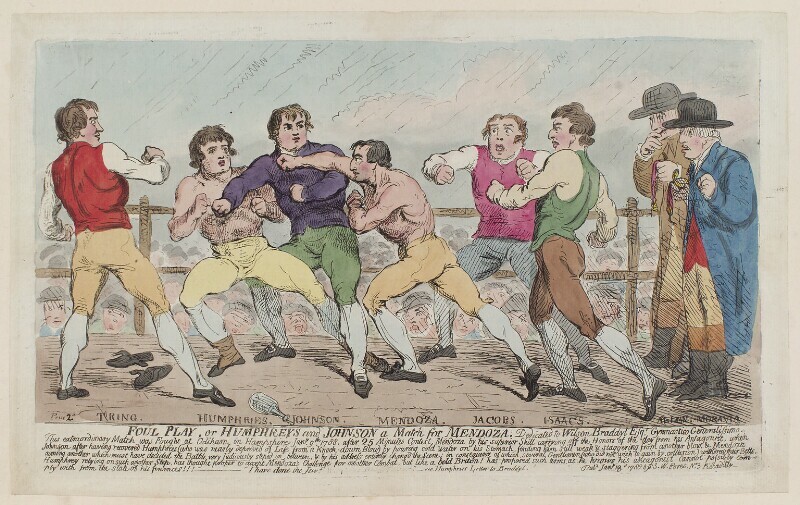 A boxer, or pugilist who became heavyweight champion between 1792 and 1795. In an age when it was common to advertise yourself with a memorable name. As the plaque states he proudly billed himself as ‘Mendoza the Jew’ in honour of his Jewish heritage. For an example of how other boxers billed themselves, Mendoza’s first recorded successful prize fight was against the wonderfully named ‘Harry the Coalheaver’. 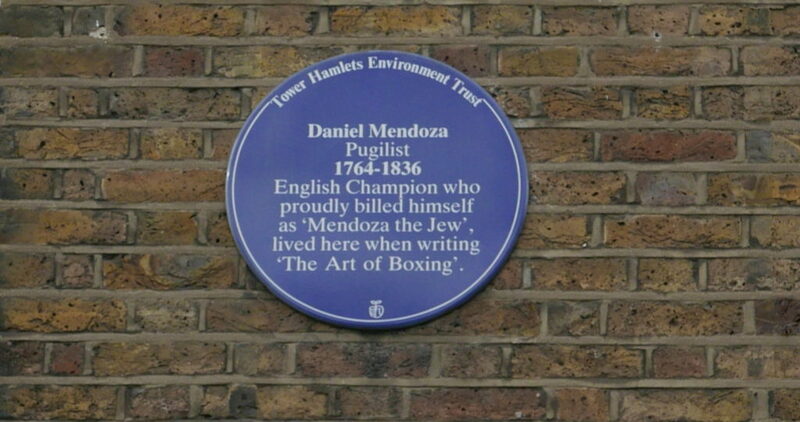 The plaque refers to Mendoza living in Paradise Row when he was writing ‘The Art of Boxing‘. 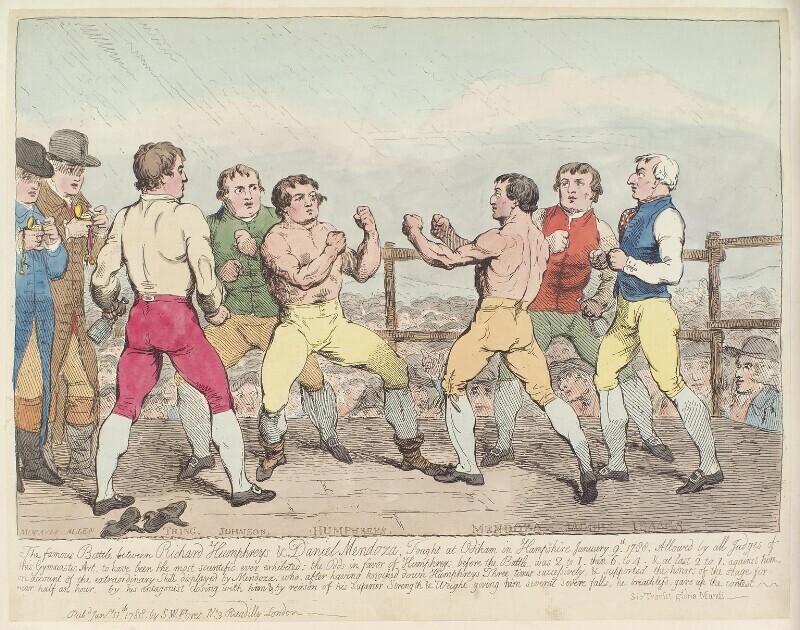 In the 18th century, boxing was mainly a punching, grappling, gouging match between two fighters. “After the many marks of encouragement bestowed on me by a generous public, I thought that I could not better evince my gratitude for such favours, than by disseminating to as wide an extent, and at as cheap a rate as possible, the knowledge of an ART; which though not perhaps the most elegant, is certainly the most useful species of defence. To render it not totally devoid of elegance has, however, been my present aim, and the ideas of coarseness and vulgarity which are naturally attached to the Science of Pugilism, will, I trust, be done away, by a candid perusal of the following pages. Boxing is a national mode of combat, and as is peculiar to the inhabitants of this country; as Fencing is to the French; but the acquisition of the latter as an art, and the practice of it as an exercise, have generally been preferred in consequence of the objection which I have just stated as being applicable to the former. The objection I hope, the present treatise will obviate, and I flatter myself that I have deprived Boxing of any appearance of brutality to the learner, and reduced it into so regular a system, as to render it equal to fencing, in point of neatness, activity, and grace. The Science of Pugilism may, therefore, with great propriety, be acquired, even though the scholar should feel actuated by no desire of engaging in a contest, or defending himself from an insult. 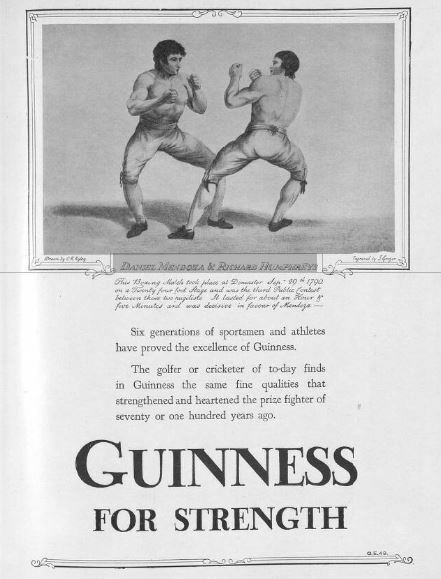 Those who are unwilling to risque any derangement of features in a real boxing match, may, at least, venture to practice the Art from sportiveness and sparring is productive of health and spirits as it is both an exercise and an amusement. Daniel Mendoza put his approach into practice throughout his career. He was highly successful and his name became very well known across the country. He made (and lost) a considerable sum of money. His most famous fights were against Richard Humphreys, his former trainer and mentor. These fights were captured in a series of etchings (©Trustees of the British Museum), published very soon after the fights. In perhaps an early version of the tension built up in advance of fights today, in the 18th century Mendoza and Humphreys traded insults and accusations at each other through a series of letters published in newspapers across the country. “To prevent the tedious necessity of a reference to the several letters which I have written, and which have appeared in your paper, I am induced to take my leave of the public, with the insertion once more of the conditions of my challenge to Mr. Humphreys, and I beg that the world will consider them as open to the acceptance of that gentleman, whenever he may think better of his boxing abilities. The first condition is, that I will fight him for 250 guineas a side, the second, the victor to have the door, the third, the man who first closes to be the loser, fourth and last, the time of fighting to be in the October Newmarket meeting. After the loss of the first fight, Mendoza won the next two fights. The following etching shows what looks to be the closing stages of the fight on the 6th May 1789 with Mendoza on the left and a collapsing Humphreys on the right. 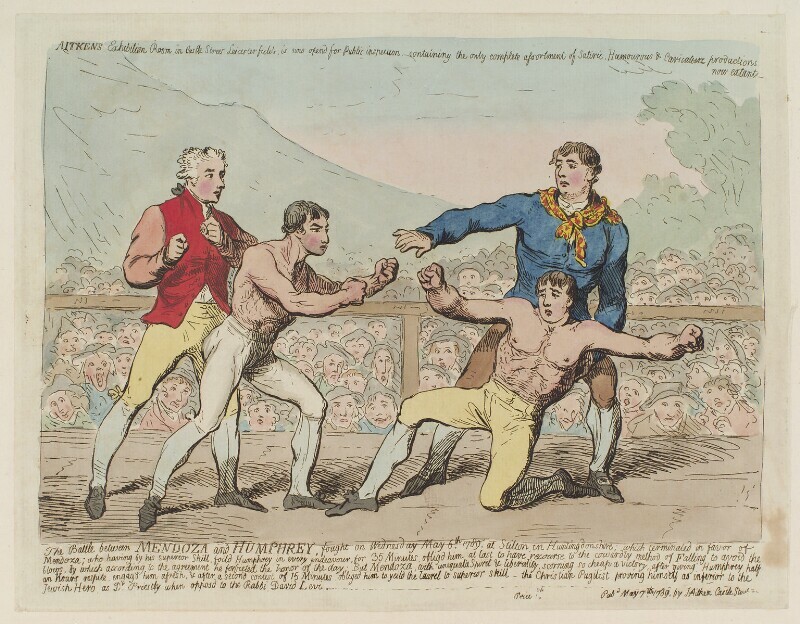 After his boxing career declined in the 1790s, Mendoza pursued a number of other money making opportunities including landlord of the Admiral Nelson in Whitechapel, the occasional boxing match, running his own academy, and also what today would probably be classed as a ‘bouncer’ at the Covent Garden Theatre. The theatre management were attempting to increase ticket prices, which resulted in riots and protests in the theatre. In another newspaper report, Daniel Mendoza was reported as being at the head of “150 fighting Jews and hired Braizers, as Constables.” His actions supporting the theatre management did not help his popularity with Londoners as he was seen to be supporting the theatre management rather than the common theatre goer. I can find very little information on Daniel Mendoza’s family. 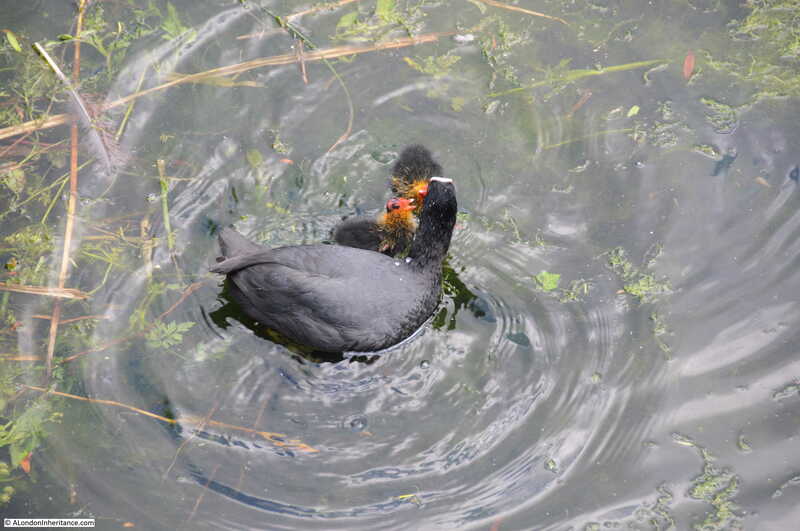 He appears to have had two sons and a daughter. One son also named Daniel (so presumably the eldest son) appears in a number of newspaper reports accused of robbery and also wounding a man with a penknife. In another newspaper report, his married daughter along with another woman were reported as being assaulted by two cab drivers. Daniel Mendoza died in September 1836. his lasting legacy were the changes to boxing through his approach to ‘scientific boxing’ which started the move of boxing towards a rules based sport. The view from Mendoza’s house on Paradise Row must look very different today, with the volume of traffic on the Cambridge Heath Road, but good to see this terrace of houses still standing. To get a view of Nettleswell House I turned off Old Ford Road into Victoria Park Square. It was difficult to get a good view of the buildings as they are concealed behind a tall brick wall, however they look in fine condition. Nettleswell House is a Grade II listed building. The listing states that the building is late 17th century with early 18th century alterations. 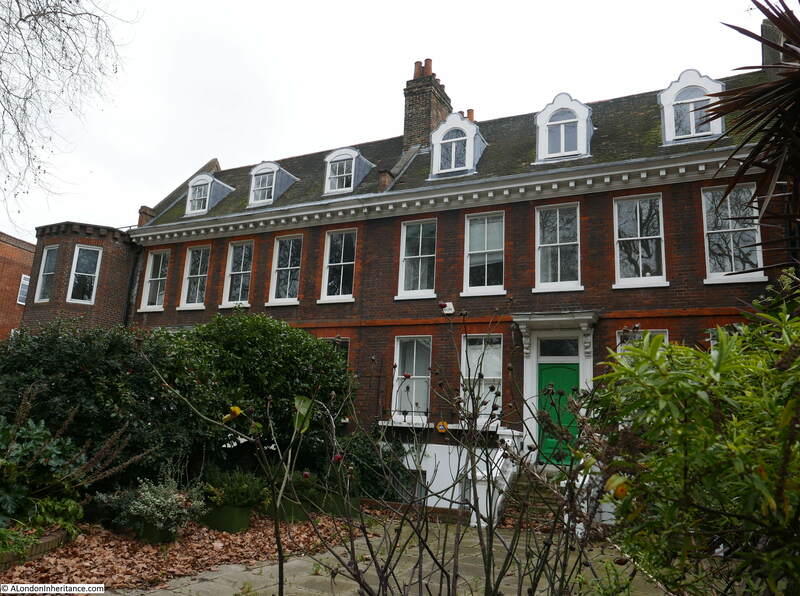 In my post on “New Deal For East London – Stepney Green” I found one of the buildings built by the East End Dwellings Company – Dunstan House on Stepney Green. Walking along Victoria Park Square I found another. 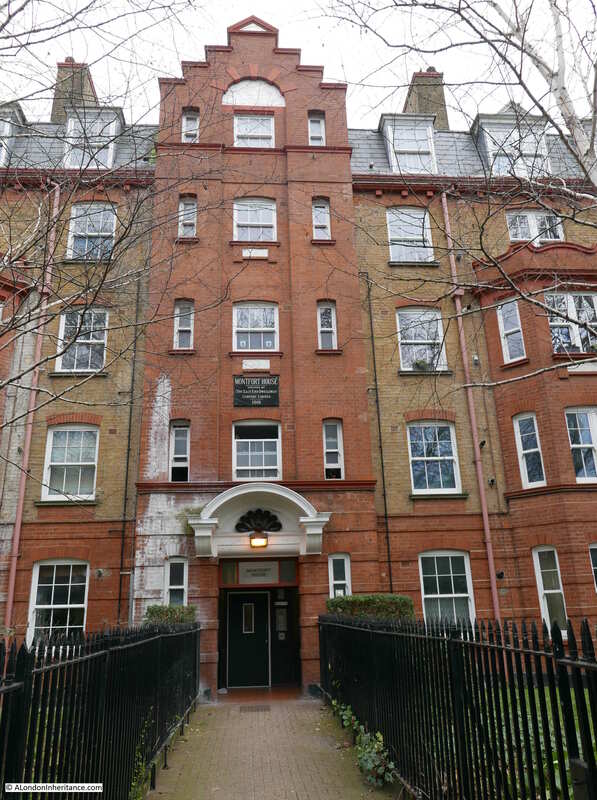 Montford House was built by the company in 1901, two years after the Stepney Green building. 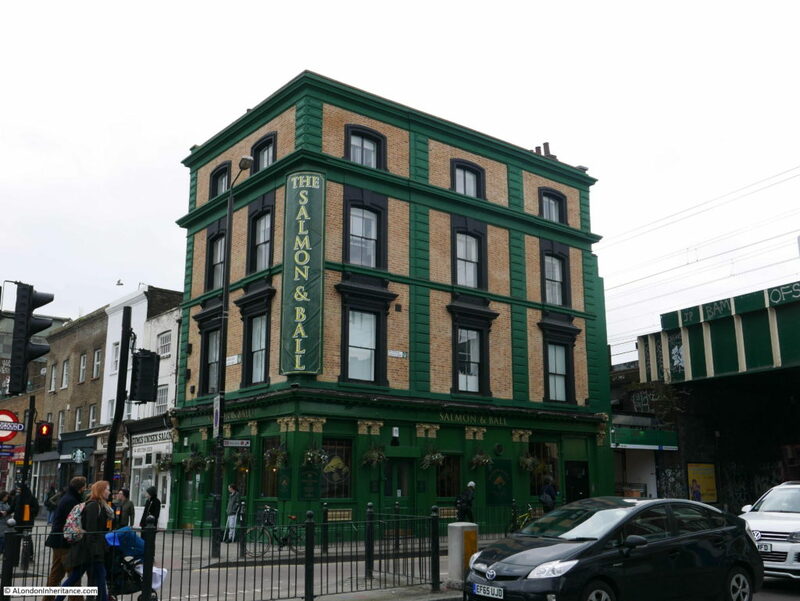 The name apparently is a reference to Simon de Montford and there are stories that he was blinded at the Battle of Evesham 1265 and became a beggar in Bethnal Green (the same story is sometimes given as the source of the name of the Blind Beggar pub). In reality, Simon de Montfort was killed at the Battle of Evesham and was buried at Evesham Abbey, along with Henry, one of his sons. His other son, also called Simon did arrive in Evesham, but too late to help the cause of his father. He later escaped to France. There are a good number of the buildings of the East London Dwellings Company remaining. One of my ever growing list of projects is to map and photograph all their buildings. Along one side of Victoria Park Square is a magnificent group of buildings, all in good repair, and as indicated by the Architects’ Journal title for these buildings, they all stand back from the street, separated by a good sized front garden. 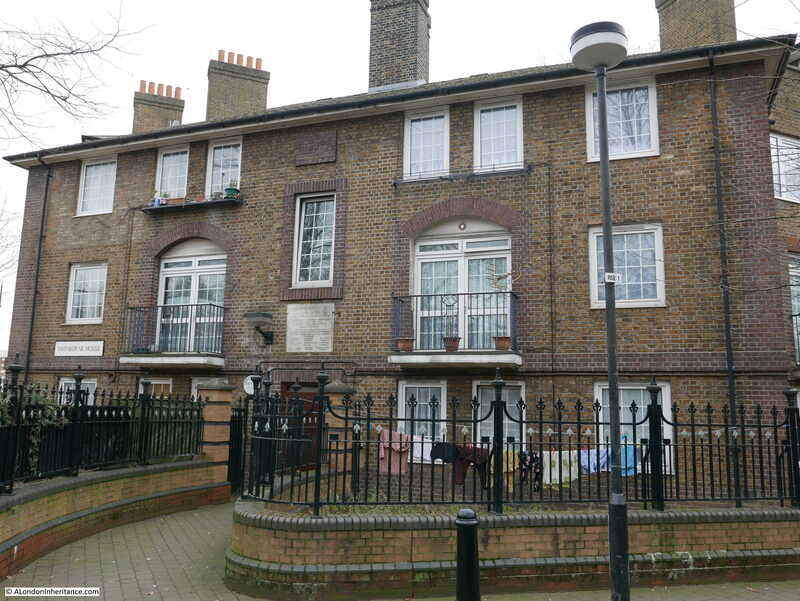 Finding this terrace was the last of four locations in Bethnal Green. I then walked down to Stepney, so to complete the post, here are some of the buildings to be found on the route from Bethnal Green to Mile End Road, along Cambridge Heath Road. 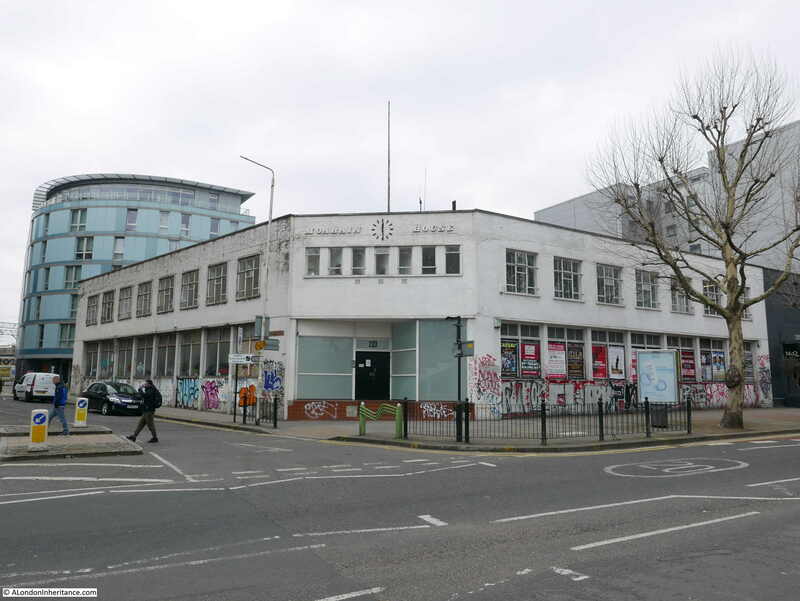 This building is along Roman Road, alongside Bethnal Green Gardens. 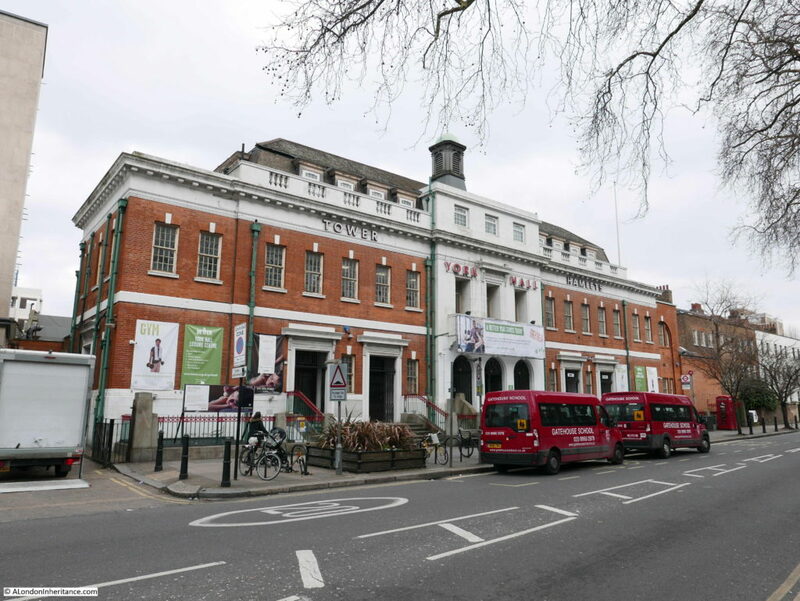 The building is Swinburne House and it demonstrates the change during the early decades of the 20th century from housing built by philanthropic organisations such as the East End Dwellings Company to council built properties. A stone on the front of the building records that the stone was laid on the 1st July 1922 to commemorate the erection of 166 dwellings by Bethnal Green Borough Council. The names of the housing committee are also recorded. I believe that this was the factory of umbrella manufacturers Solomon Schaverien. Many of their umbrellas include a label with the name Moarain on the inside of the umbrella. I would not be surprised if the factory was replaced by an apartment building in the next few years. Just after Moarain House, the railway from Liverpool Street Station crosses Cambridge Heath Road. 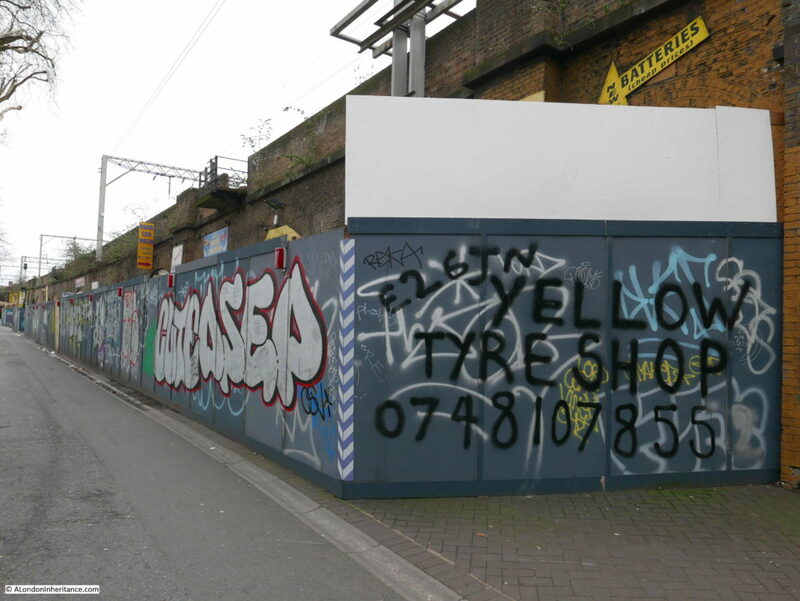 All the railway arches along Malcolm Place have been closed off, and the typical businesses that normally occupy railway arches (car wash, car repair, tyres, light manufacturing etc.) have all moved out. 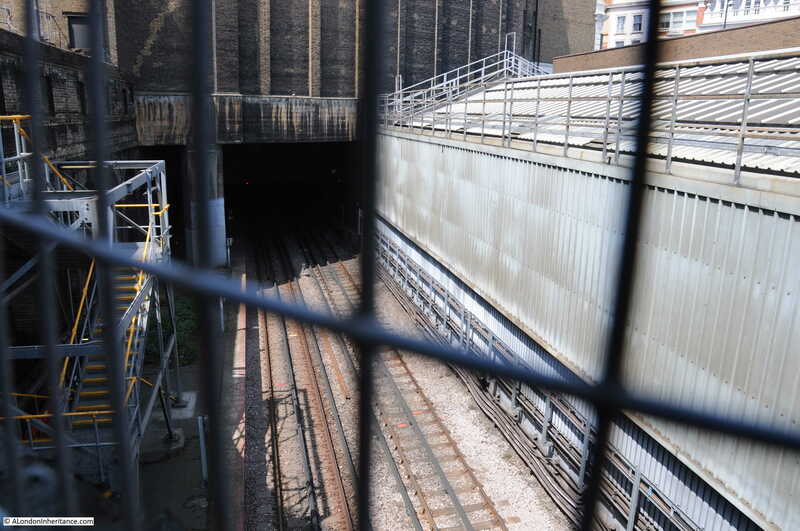 Network Rail are planning to redevelop these arches and the application for planning permission submitted to Tower Hamlets Council shows a row of arches with glazed brick for the piers, glass and stainless steel fascia – very different to the arches as they are now. The proposed use of the arches are as a cafe, restaurant, drinking establishment, retail, light industrial and warehousing. No doubt increasing revenue for Network Rail, but another loss of the traditional use of railway arches by small businesses in East London. After passing under the railway I was soon at Mile End Road for the locations in my previous post. 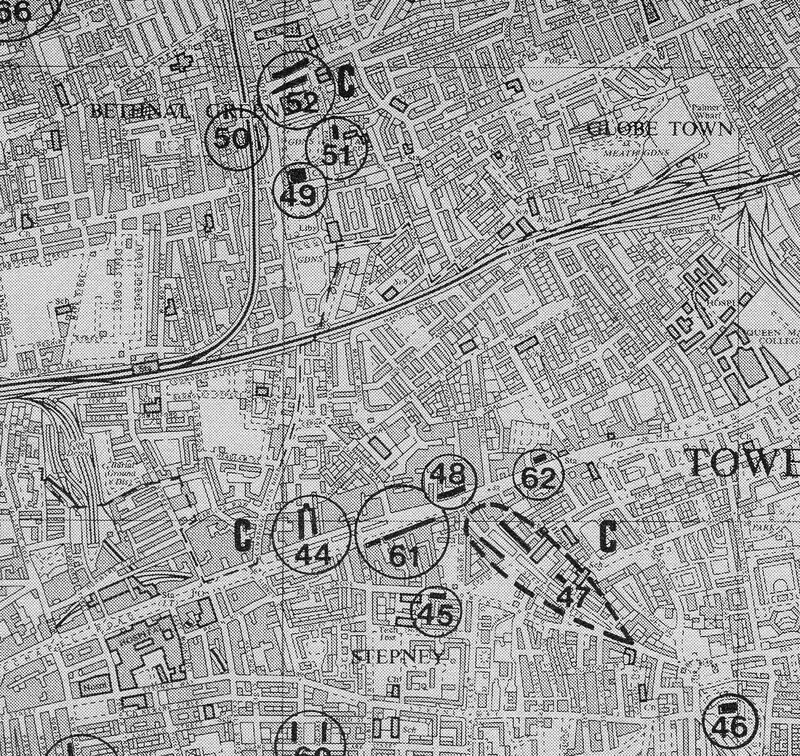 It was good to see that all the sites listed in 1973 are still to be found in Bethnal Green, and in good condition. I find these walks fascinating not just by seeing if the sites listed in the Architects’ Journal have survived, but also the chance finds along the way, and in this walk opening a window on the world of boxing in the late 18th century, another building by the East London Dwellings Company and the evolution from charity to council construction of homes. I am now almost through all 85 sites listed in 1973, just a couple of groups of buildings to visit, in Greenwich and the area running north and west along the River Lea / Bow Creek. Hopefully these walks will not be as windy and cold as my walk through Bethnal Green. 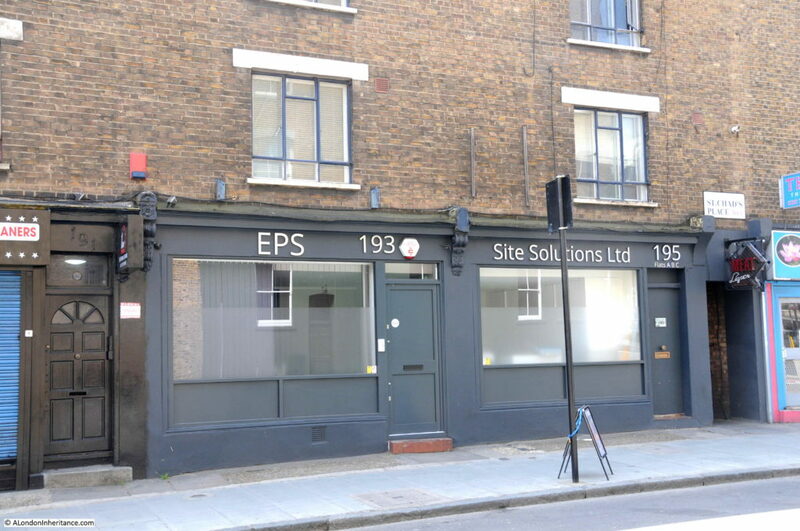 This entry was posted in London Buildings, London History, London Pubs, London Streets and tagged Architects' Journal, Bethnal Green, Daniel Mendoza on June 24, 2018 by admin. 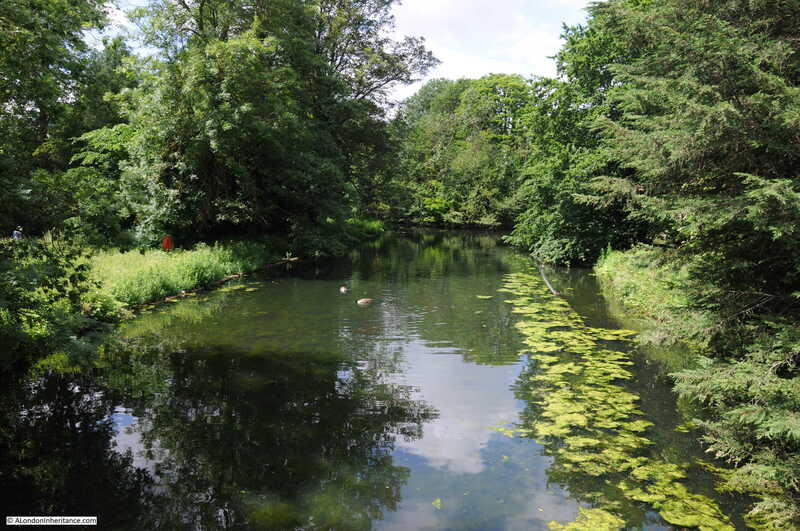 I had not been intending to write about Chiswick House and Gardens for today’s post. I had been planning to write about one my father’s photos, one showing a street with the open space remaining from the clearance of bombed buildings. I tracked down the street and found gardens occupying the space where I thought the bombed buildings had been, however when I started writing the post, I checked the photos in more detail, aligned with some old maps, including the LCC Bomb Damage Maps, and found I had taken photos of the wrong end of the street. I usually get the location right before I visit, however this time I missed some obvious architectural features which I should have seen whilst walking the street. I will need to go back and photo the correct part of the street, so for today I have fallen back on a recent trip out to Chiswick, to visit Chiswick House and Gardens. 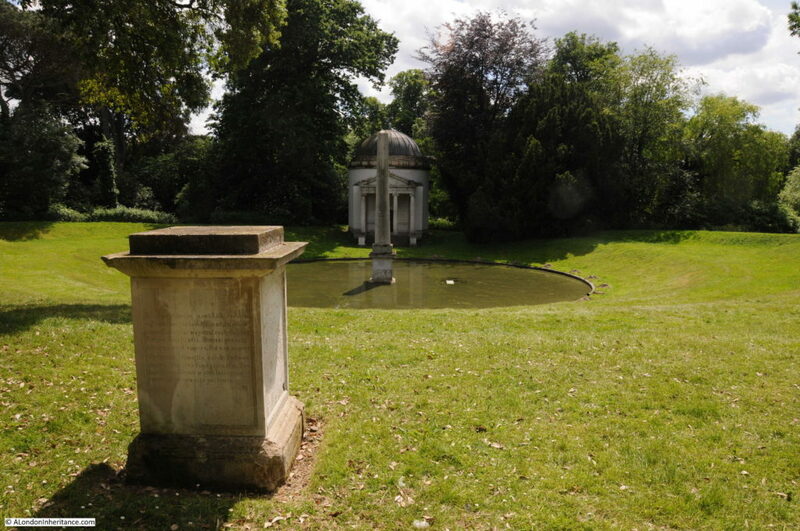 Chiswick House and Gardens are found just to the west of the Hogarth roundabout, between two busy roads, the A4 which runs out to the M4 motorway and the A316 which runs to the south west and crosses the River Thames over Chiswick Bridge. It is a busy and densely built area of west London. 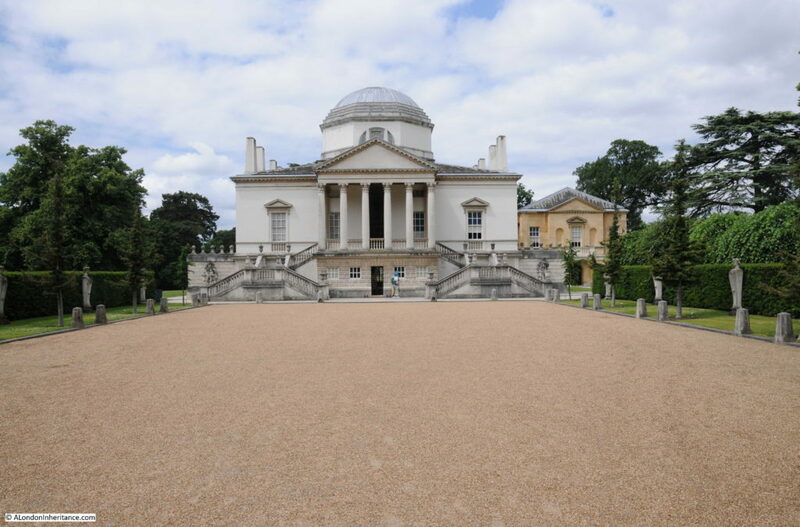 The original Chiswick House was constructed in the 1620s, at a time when country houses were being built in the area, to take advantage of the benefits of being relatively close to London with the river providing access to the City. The house was inherited by Richard Boyle, the 3rd Earl of Burlington in 1715. At the same time he also inherited Burlington House in Piccadilly, which became his London house. 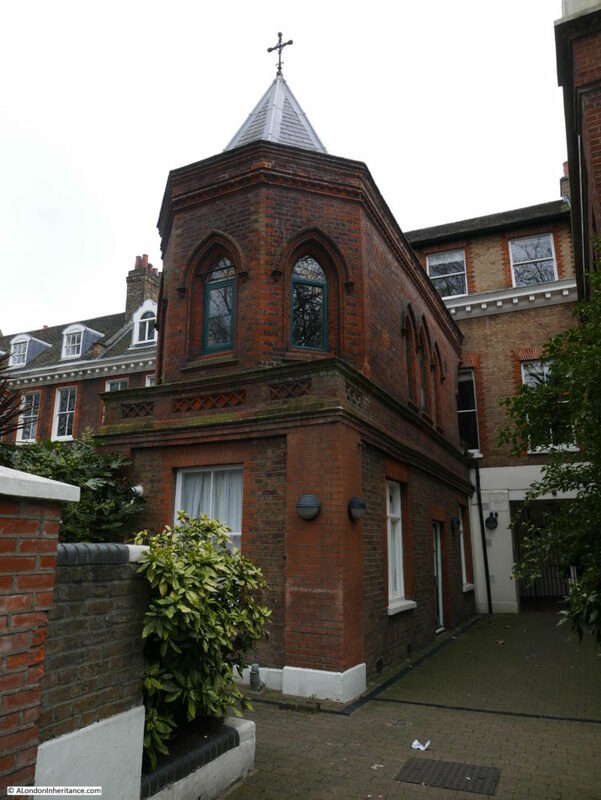 Rather than use the house in Chiswick as a family residence, he planned to build a new house where he could use the architectural inspiration from his Grand Tours of Europe, and would also house the collections he had gathered touring Europe and where he could entertain. The new house was built between 1726 and 1729, just to the north west of the original house. 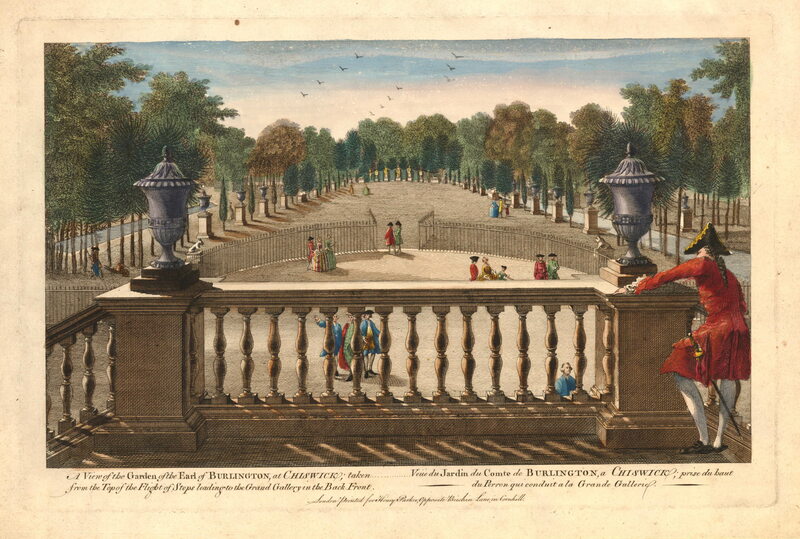 Work on the gardens continued until the 1740s and the inspiration for many of the buildings that were distributed around the gardens would also come from his experiences during the Grand Tours. The Grand Tour was part of the education of an 18th century aristocrat, with months travelling through France, Germany and Italy to provide experience of the major European cultures. The majority of these tours would have Italy as their main destination. The tours were also used to build collections and many aristocratic residences of the time would be full of purchases made during the Grand Tour. 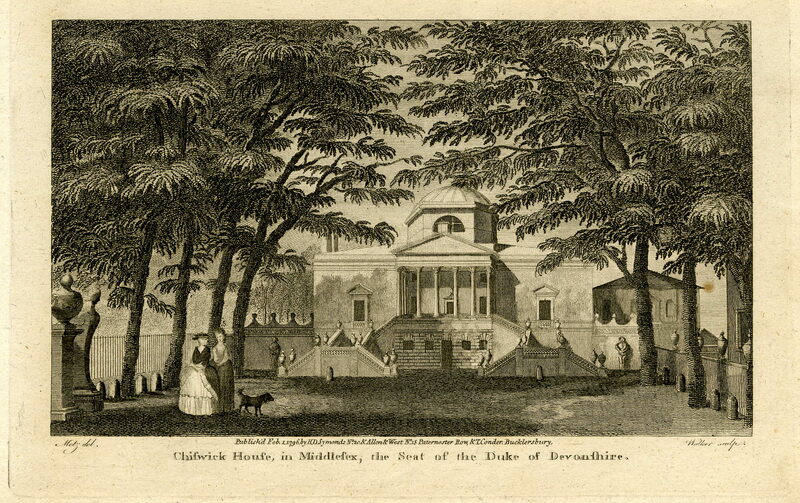 Chiswick House and Gardens passed through generations of the Dukes of Devonshire after Richard Boyle’s death in 1753. 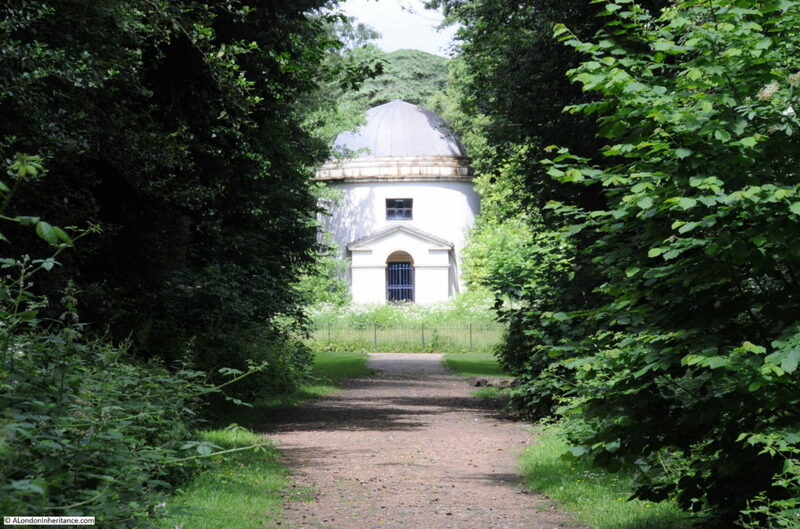 The 5th Duke demolished the original 17th century Chiswick House. The 6th Duke of Devonshire made significant changes to the gardens in 1811 with the purchase of additional land and the construction of formal gardens and the large conservatory. Use of the house changed during the later years of the 19th century. The house was let to a number of different tenants and for a period was used as a lunatic asylum. 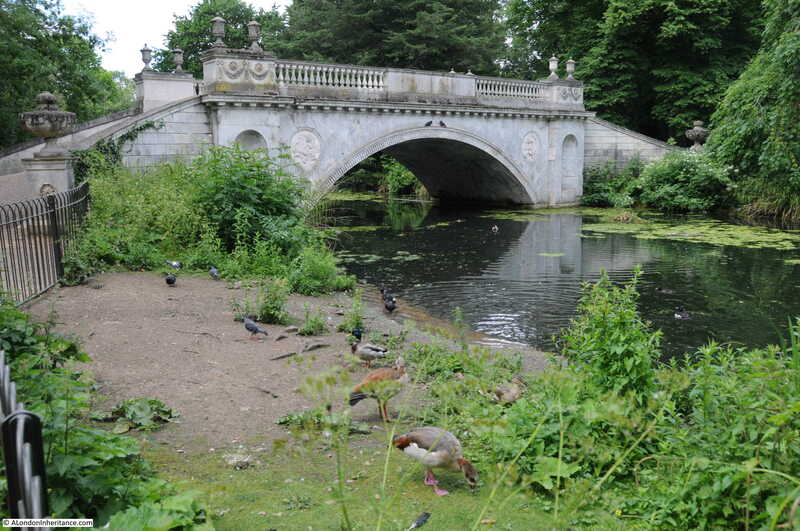 In 1929, Chiswick House and Gardens were sold by the 9th Duke of Devonshire to Middlesex County Council who opened the gardens as a public park. After the war, the house was in need of serious restoration and whilst the gardens remained with the council, the house passed to the Ministry of Works in 1948. 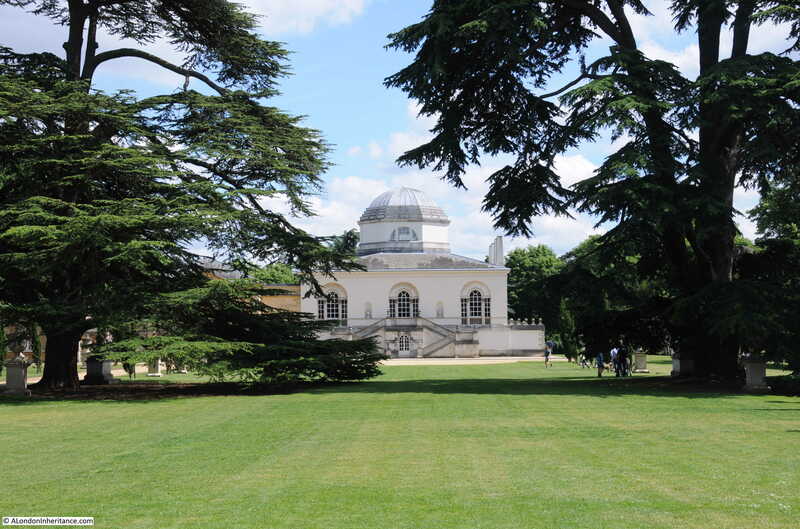 Today, the house and gardens are managed by the Chiswick House and Gardens Trust, set-up by the London Borough of Hounslow and English Heritage. 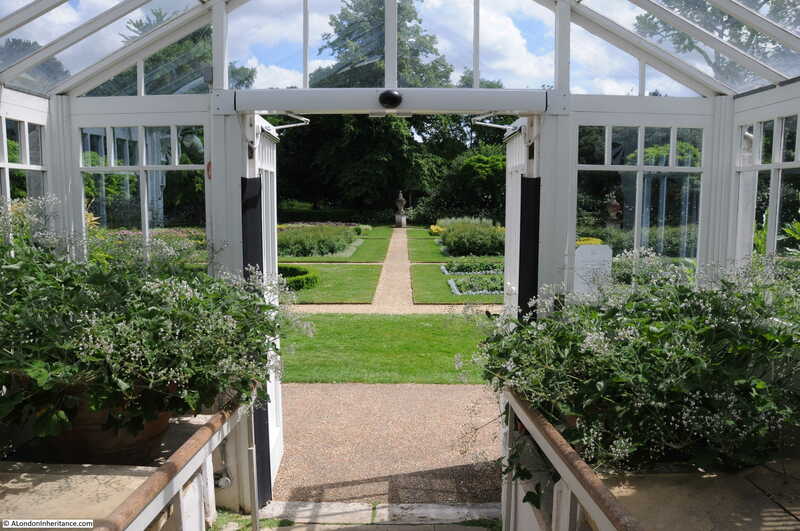 The gardens are free to enter, and despite some of the land being sold over the years as Chiswick land was needed for building, there are still 65 acres of gardens to explore with many of the original features from the time of Richard Boyle, the 3rd Earl of Burlington. English Heritage manage the house and charge a fee for entry. Unfortunately there are also signs banning photography inside the house. 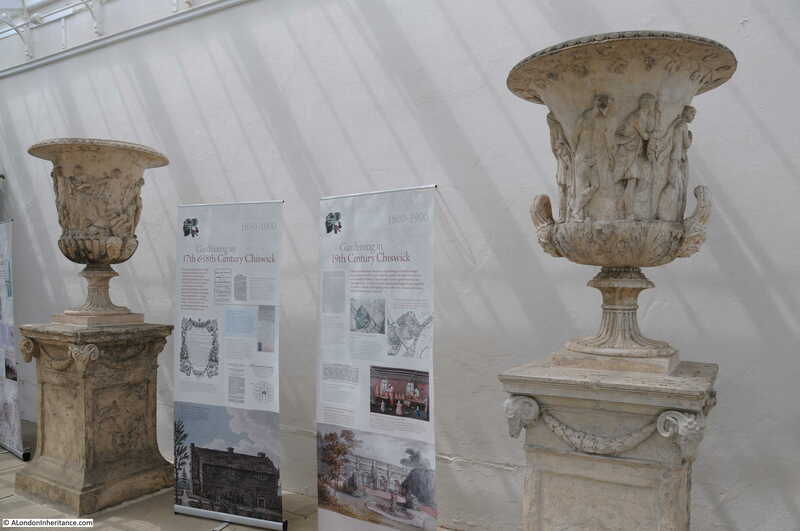 Walking the house, it is clear it was not designed as a home, but does provide a series of rooms designed for the display or art and sculpture, and there are still a significant number of works on display today. The same view of the house in 1796. 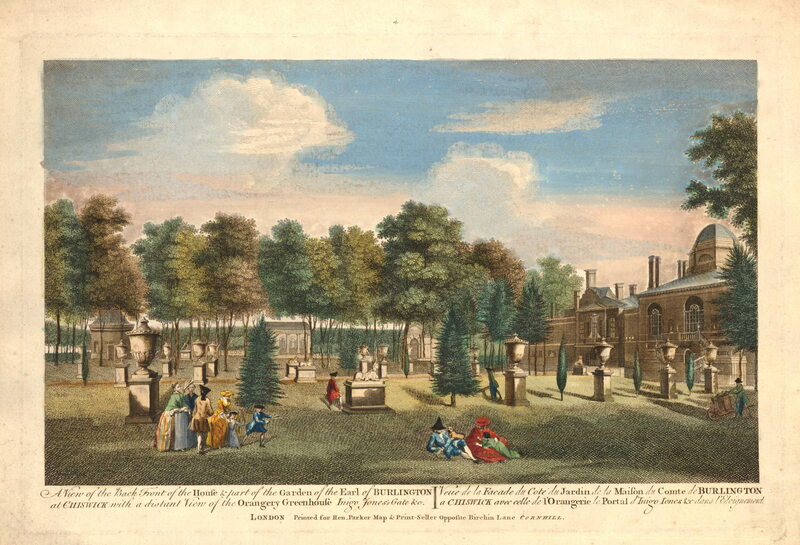 The following view from around 1770 shows the rear of the house with the lawns lined with large urns atop pedestals – much as can be seen in the gardens today. In the photo of the rear of the house shown above, steps can be seen leading up to a gallery from which the following view was drawn in around 1770. 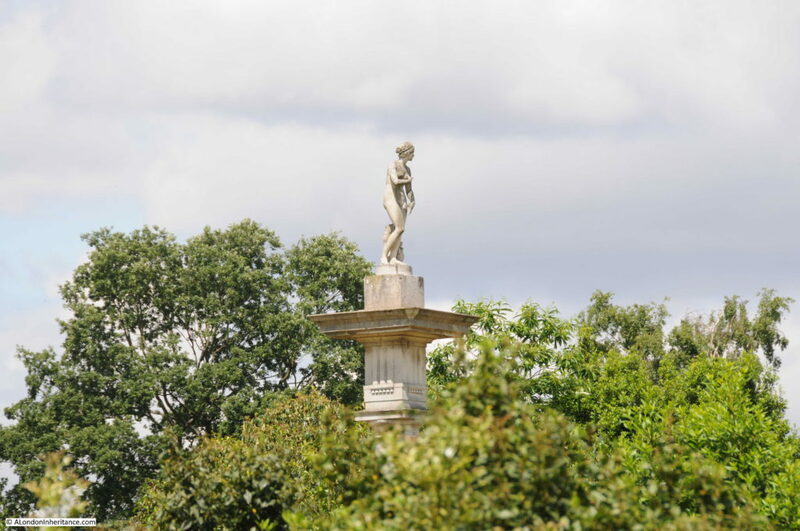 In the above view, a set of statues can be seen set in the hedge that forms the end of the large open area at the rear of the house. 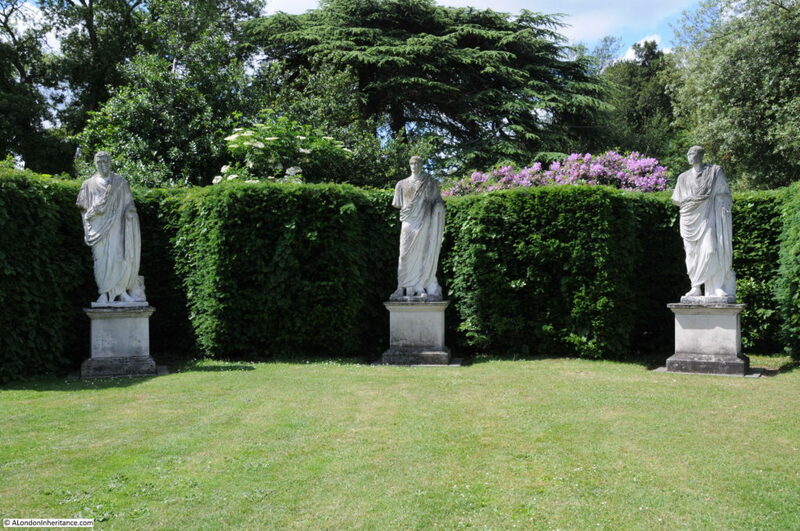 I do not know if they are the same statues, however in the same place today, statues can be found in alcoves cut into the hedge at the far end of the lawns at the rear of the house. The Ionic Temple seen from across the lake. 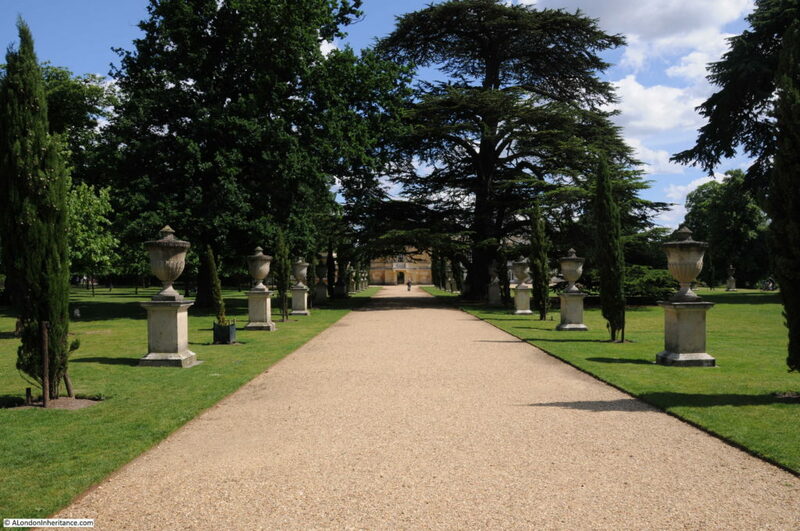 The design of the gardens incorporates long walks with a building, obelisk, or some other feature which can be seen the full length of the walk. Artists easels with 18th century views from the same spot can be found across the gardens. A very imaginative feature, and it is easy to picture an 18th century artist sitting at the same place, drawing the same view. 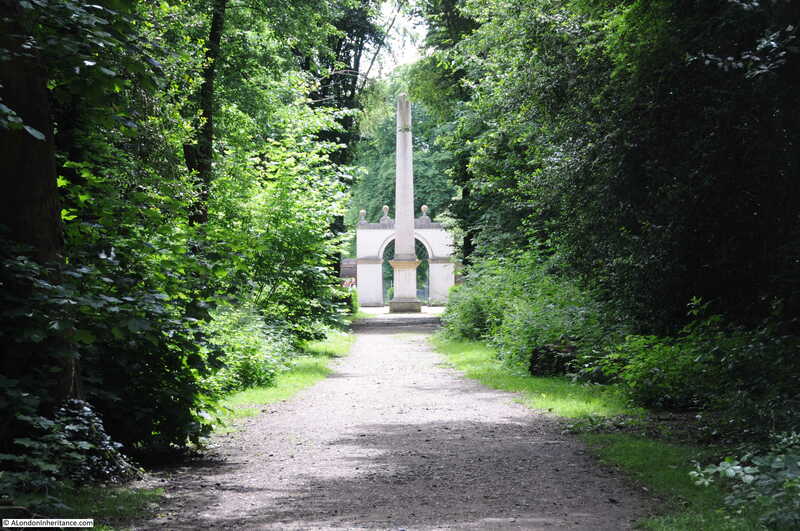 The view looking down one of the walks with an obelisk in frount of the gate at the Burlington Lane entrance. A large artificial river runs across the full length of the gardens from the north west to the south east. Towards the north western end of the lake is this classically designed bridge. 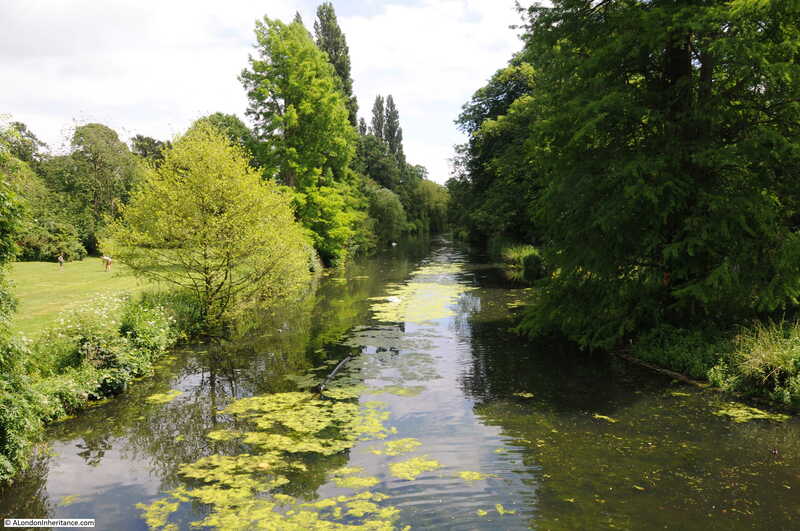 The view looking along the length of the river towards the south eastern end of the gardens from the bridge. And the view from the opposite side of the bridge. Standing on the bridge and looking at the views along the lake it is hard to believe that this is west London, however there is a constant reminder of where we are in the sky overhead. 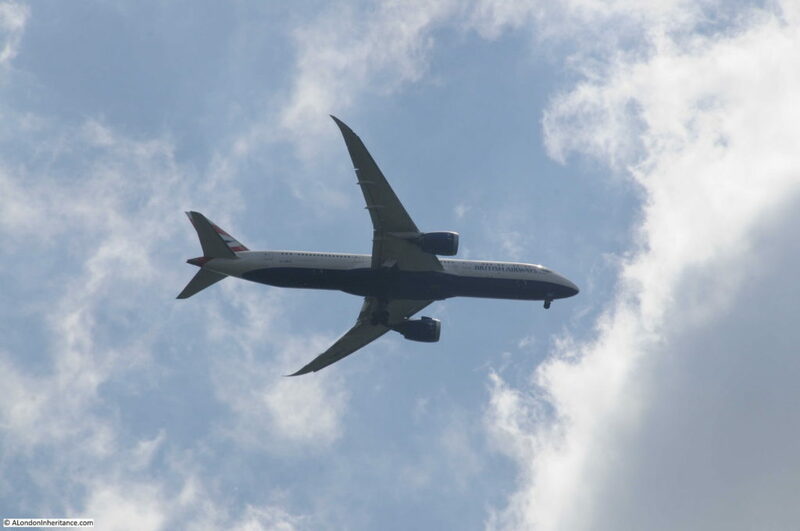 Chiswick House is a short distance from Heathrow Airport and under one of the flight paths and on the day I was there, a continuous procession of aircraft flew overhead coming into land. But the wildlife on the lake seems blissfully unaware of the planes flying overhead. The amphitheater, another obelisk and the Ionic temple. A statue of Venus rising above the trees atop a doric column. During the later years of the 20th century, the conservatory was almost derelict and the collection of rare camellia trees housed in the conservatory was in serious danger. Considerable restoration work was carried out, completed in 2010 and the conservatory today looks magnificent. The view from the conservatory to the formal gardens. 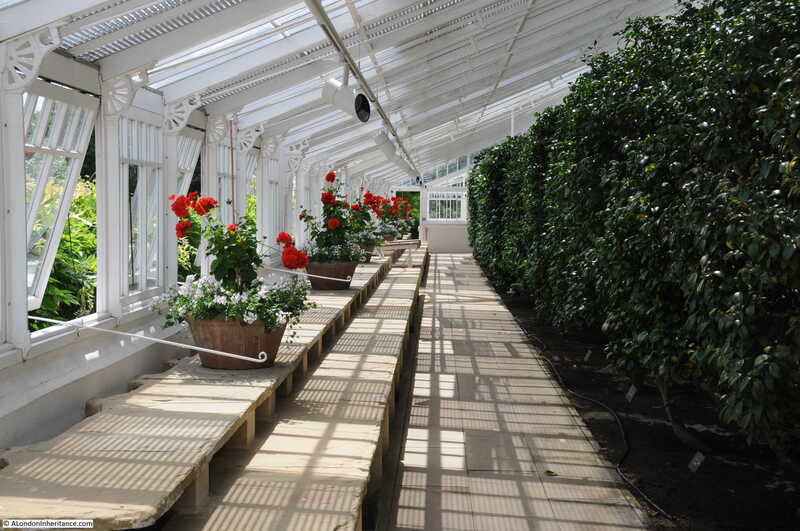 The camellia collection that runs the length of the conservatory is considered of international importance. 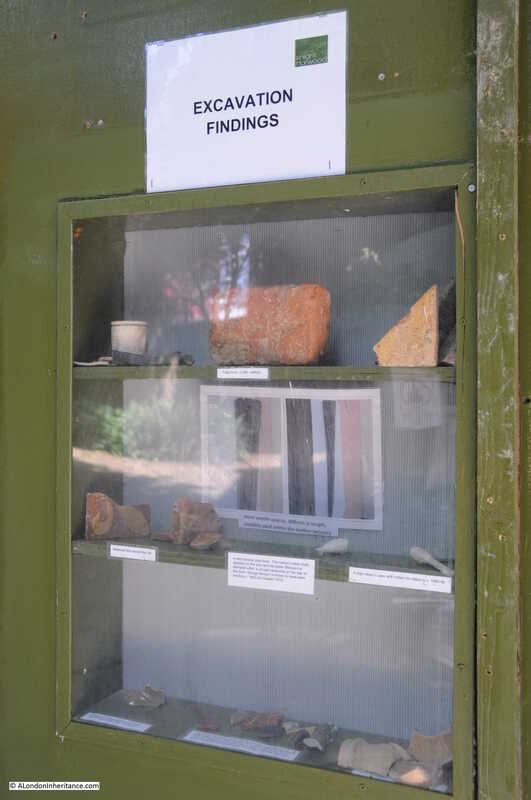 The collection includes some trees surviving from the Duke of Devonshire’s original collection. The camellia trees were all dense green leaves during my visit, but must look magnificent when in flower. Inside the conservatory are two Coade stone vases. These were originally outside the conservatory, alongside steps leading down to the gardens. They were manufactured at the Coade stone factory in Lambeth, on the southbank of the river by Westminster Bridge. 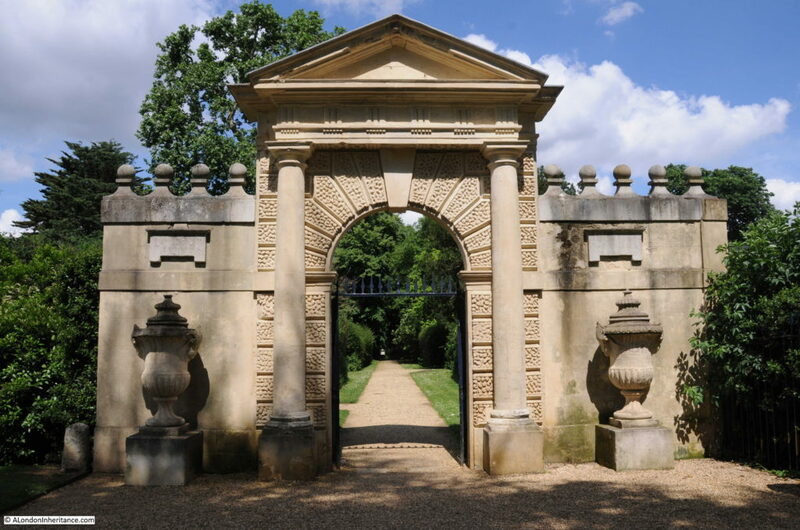 The Inigo Jones Gateway, on the pathway between the conservatory and the house. A walk around Chickwick House and Gardens provides a wonderful break from the busy city streets and if it were not for the planes flying into Heathrow, you could be walking through a country park set in the countryside rather than west London. 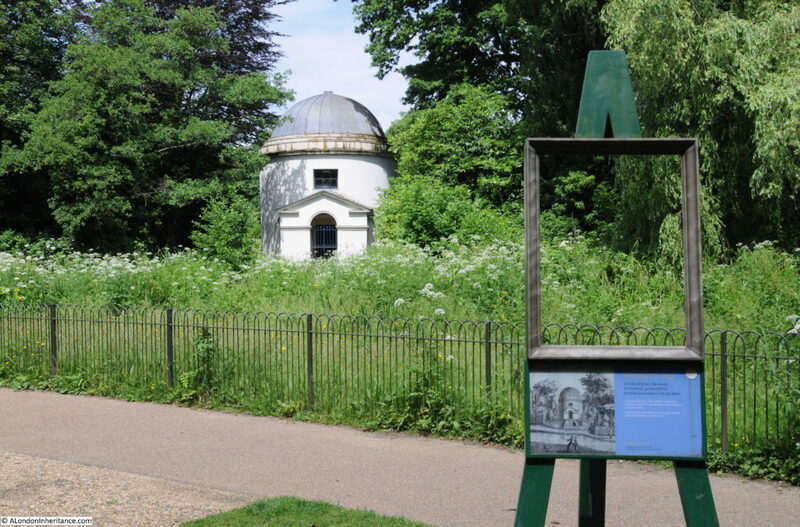 Chiswick House and Gardens are a short distance from Hogarth’s House, and a visit to both provides a snapshot of 18th century Chiswick. 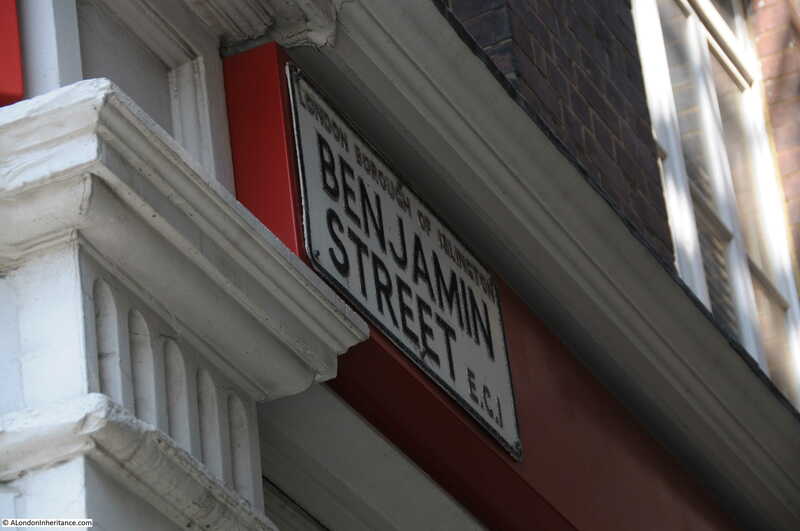 Now to find the time to go back and photograph the correct end of a London street. 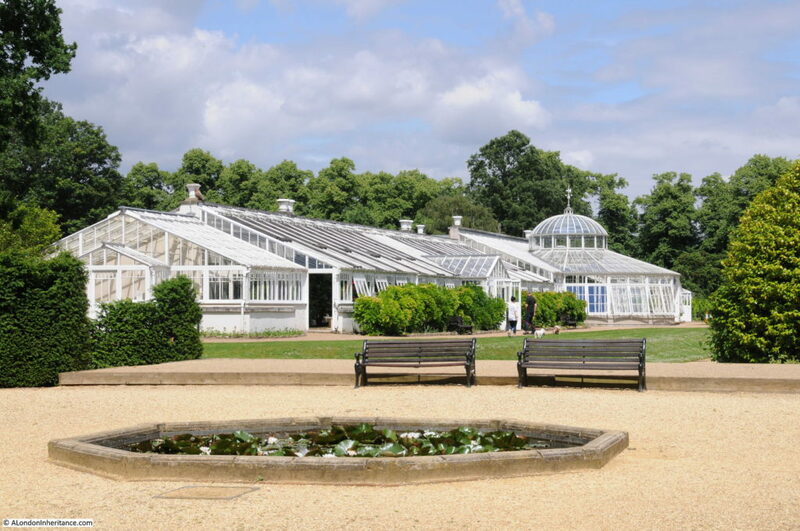 This entry was posted in London Buildings, London Parks and Gardens and tagged Chiswick, Chiswick House on June 17, 2018 by admin. Cowcross Street runs from just north of Smithfield Market, past Farringdon Station where the street becomes Turnmill Street and then continues up to Clerkenwell Road. All these streets have a fascinating history, however for today’s post I want to focus on a single alley, Faulkner’s Alley which can be found in Cowcross Street just before reaching Farringdon Station. As I work through my father’s photos I am more and more convinced that I should switch back to black and white film. The combination of getting the lighting right, and black and white is perfect for this type photography. In the above photo there is a sign reading “M&V Coenca – First Floor”. I assume this refers to a business, but I have been unable to find any details of their trade. I am fascinated by the placing of the chair, what I assume to be a pram and the street lamp. 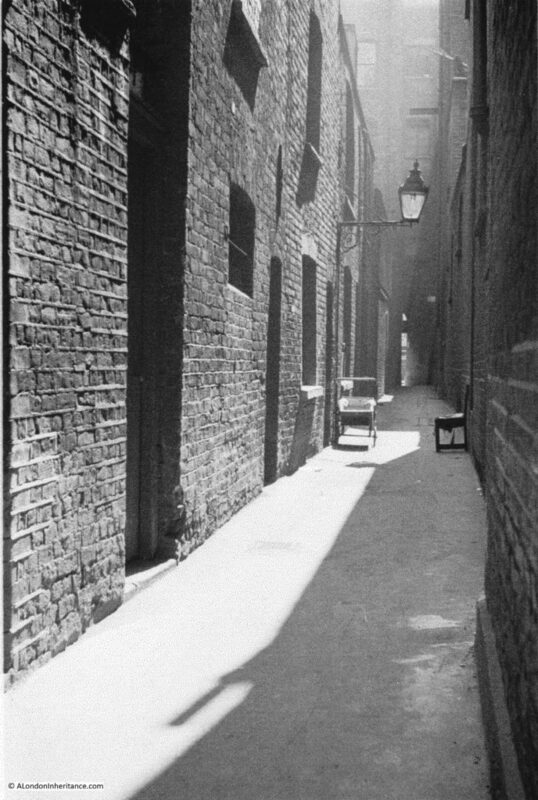 Faulkner’s Alley runs between Cowcross Street and Benjamin Street, although originally it was much longer. 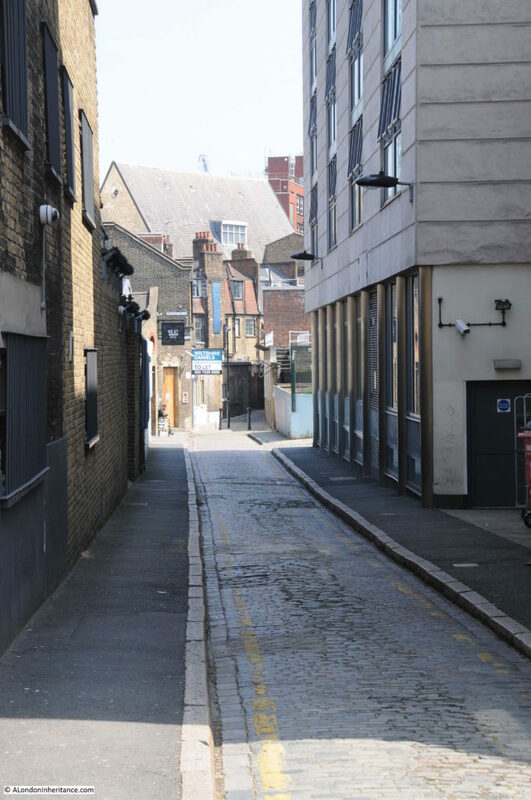 To find the Cowcross Street entrance, walk past the entrance to Farringdon Station towards Smithfield Market and a short distance after the Castle pub is the gated entrance to Faulkner’s Alley. The entrance looks as if it is a pedestrian entrance to the same area as the much larger entrance on the right, however there is a wall running back between the two entrances so they are completely separate entrances. Unfortunately the gate was locked during my visit, so all I could get was a view through the gate showing a similar alley to that in my father’s photos. 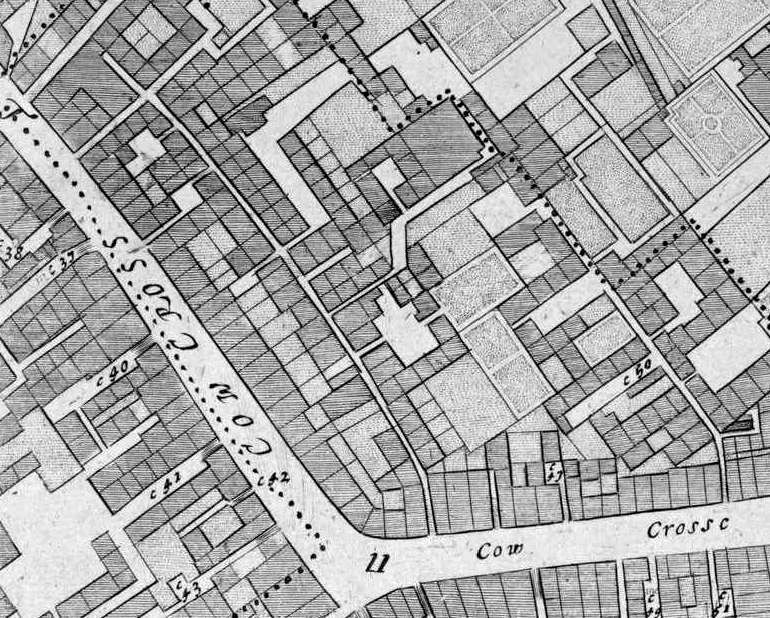 The following extract from the 1895 Ordnance Survey map shows Faulkner’s Alley in the centre of the map, between Cowcross Street and Benjamin Street. If you follow across Benjamin Street, there is a continuation of an alley indicating that Faulkner’s Alley probably once extended much further. 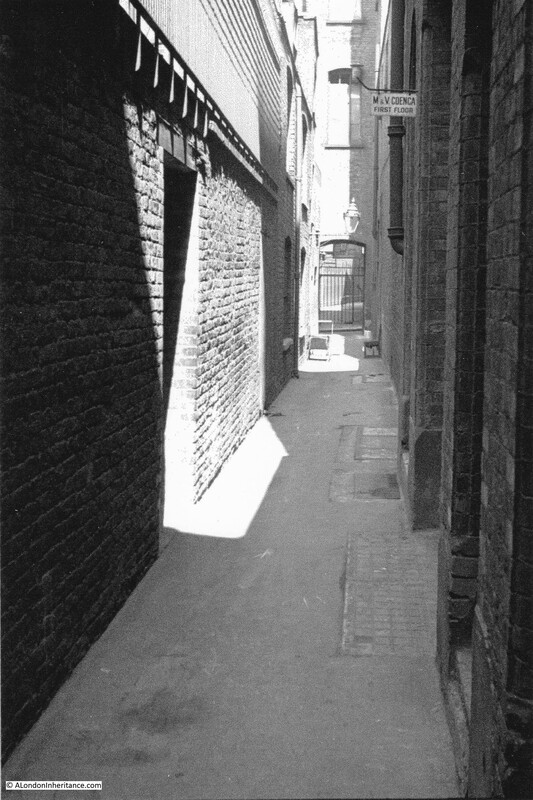 As the entrance in Cowcross Street was locked I walked round to Benjamin Street to see if the entrance there was open, as in the past it has always been possible to walk through the alley. However I was rather shocked by what I found. The southern side of Benjamin Street is now a building site. Which extends a considerable distance along the street. Just here on the right is where the entrance to Faulkner’s Alley was once located. 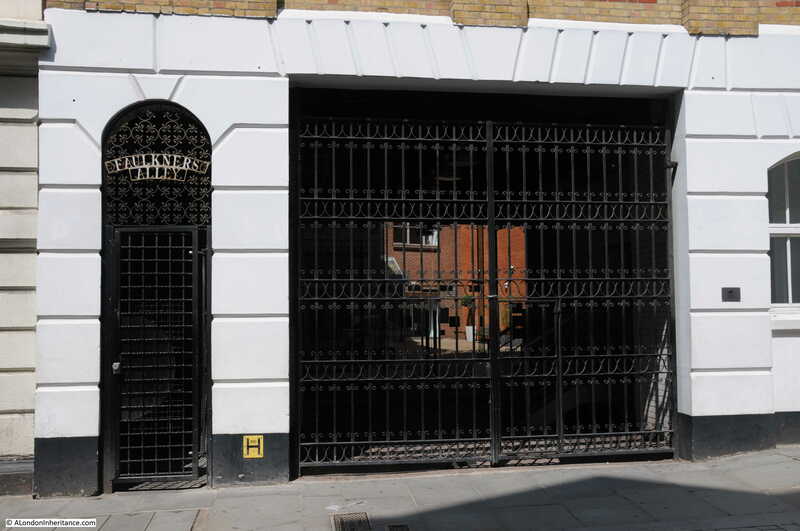 It was a similar gated entrance to the one in Cowcross Street, with the same style of ironwork and name above the gate. 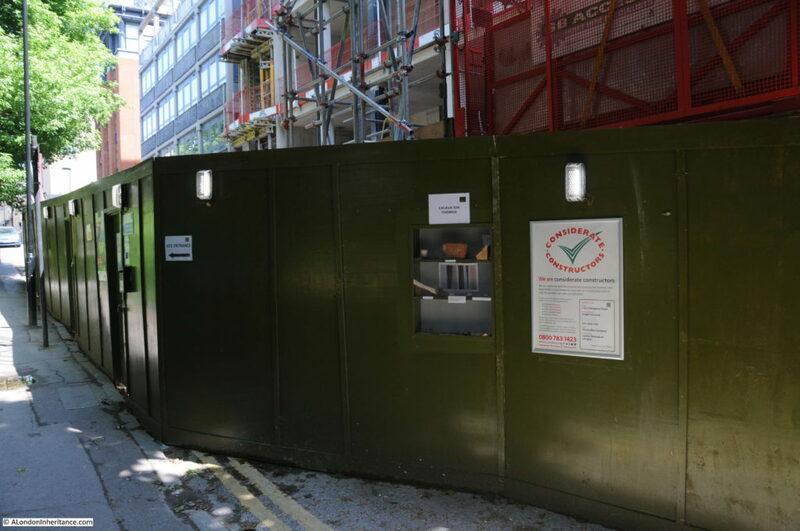 I had a look at the planning applications on the Islington Council web site and found the application relating to the building work in Benjamin Street. The application covers the demolition of the existing buildings and the build of a 6 storey building on Turnmill Street and 5 storey building on Benjamin Street, with both buildings being linked by a 4 storey building. The new building will comprise retail, office and 4 residential units. The plans show Faulkner’s Alley will still run from Cowcross Street to Benjamin Street and there will be a gate onto Benjamin Street as part of the new build. Along the alley will be a courtyard and residential reception. 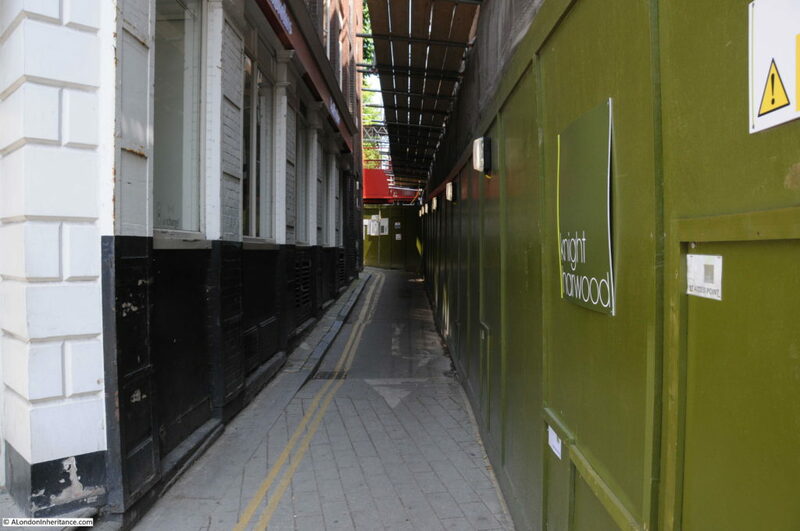 I wonder with the new development whether Faulkner’s Alley will continue to accessible to the public or with the new residential and office build, it will only be accessible to those living or working in the buildings. 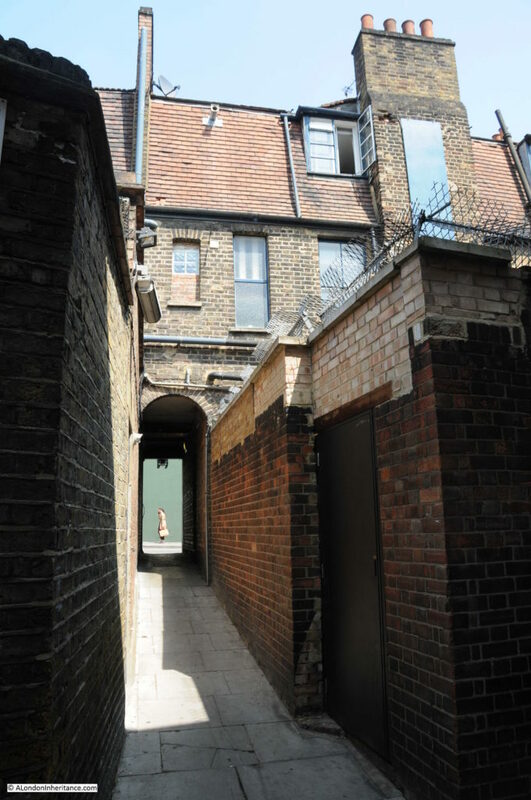 The site is owned by the Girdlers’ Company (one of the City’s livery companies) so hopefully Faulkner’s Alley will have a restoration that recognises its history and as a public alley, although I do worry when I read on the architects’ web site that the alley will be “enhanced” as part of the project. A report in the Pall Mall Gazette on the 4th September 1878 on the Princess Alice disaster, when the steamboat the Princess Alice was rammed by the collier Bywell Castle near Woolwich, included a list of the survivors, one of which was Mary Brent of Faulkner’s Alley. There was no accurate record of the number on board the steamer, or the number that died, however the Pall Mall Gazette reported that between 700 and 800 people were on board, and the number dead or missing was in the order of 700 – so Mary Brent was one of the few, very lucky, survivors. 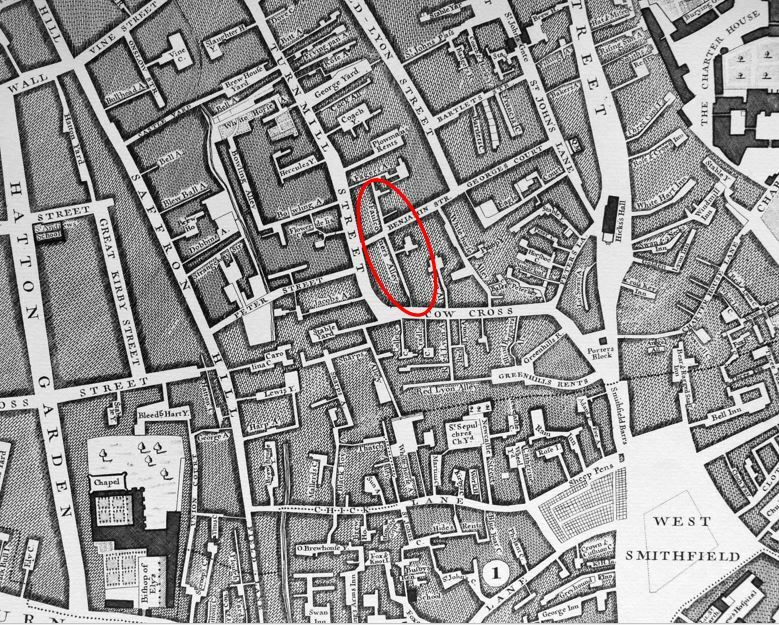 In Rocque’s map, the alley extended across Benjamin Street into what is now the edge of St. John’s Gardens. The map also provides a clue to the origin of the name. 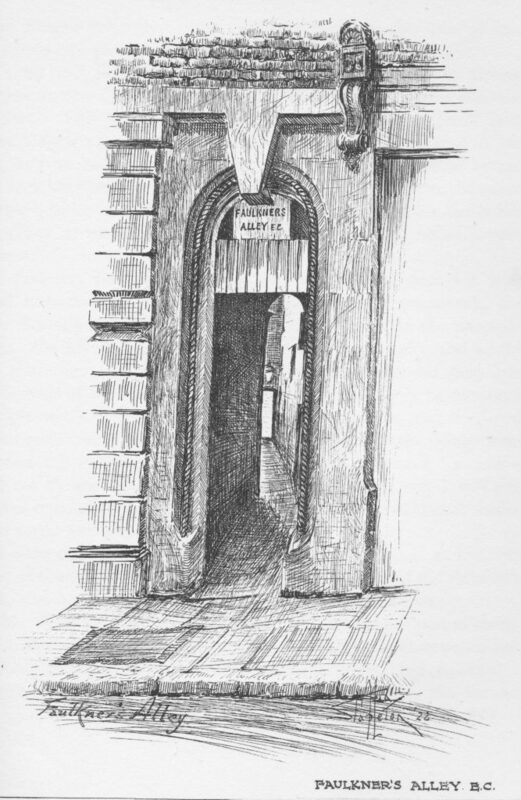 In 1746 Rocque labelled the alley Faulconers Alley which may possibly have some reference to the Falcon bird, as Faulcon was an early spelling for the bird, a name with French origins, and the word Faulconer was given to the person who would look after the birds. I have not been able to find any written reference as to why this name should have been used for the alley. Going back further, Ogilby’s map of 1676 shows the alley as a much longer alley. Unfortunately Ogilby does not provide the name of the alley as it would be interesting to see if the name was the same as in 1746. 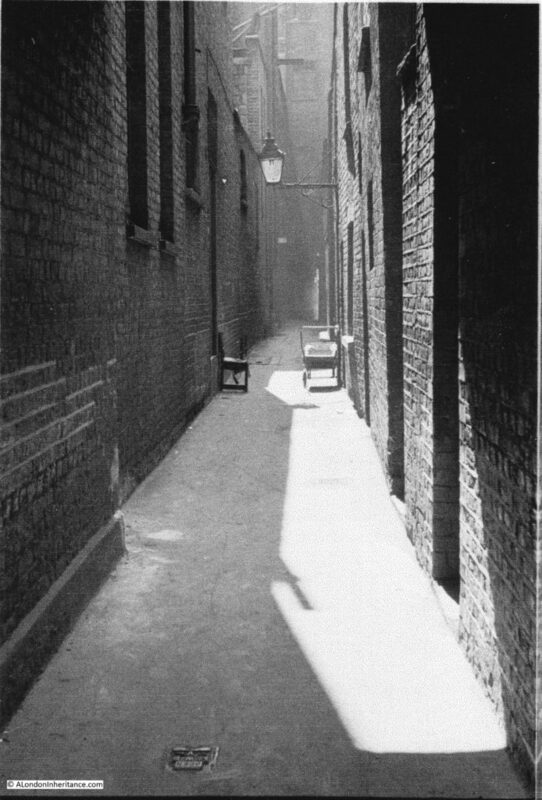 Faulkner’s Alley was a good example of the type of alley that was once so common across the city. My father’s photos from 1947 show the alley much as it must have been during the 19th century and possibly earlier – a narrow alley with tall, brick-built buildings lining the alley occupied by people and businesses. 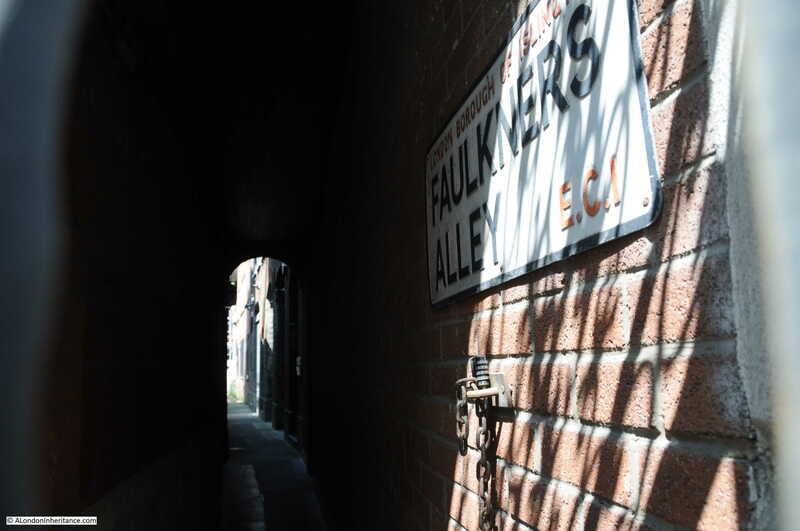 I hope that when the building on Benjamin Street is complete, Faulkner’s Alley is open again and that whatever “enhancement” has been made during building work, Faulkner’s Alley retains much of its original character. This entry was posted in London Streets and tagged Cowcross Street, Farringdon Station, Faulkner's Alley on June 10, 2018 by admin. There are places in London where the subterranean history of the city touches the surface and it is easy to imagine finding long lost geological features beneath the city streets. I am in King’s Cross Road, a street that runs from Pentonville Road to Farringdon Road. 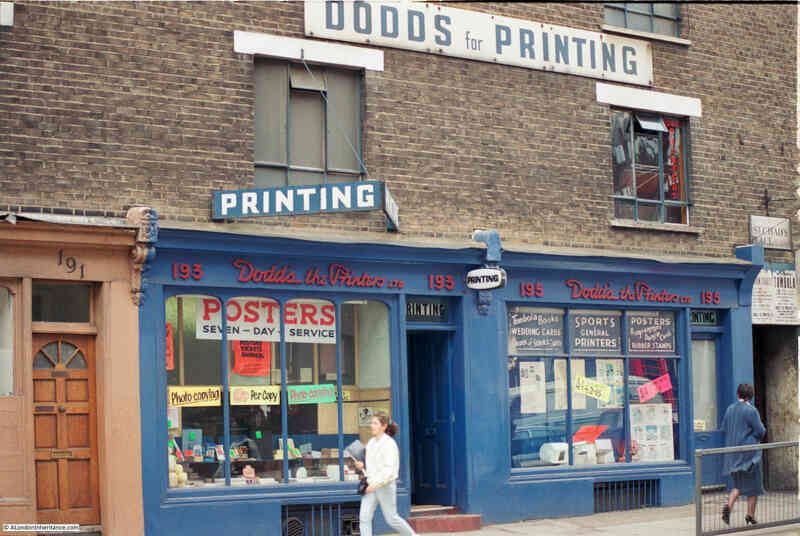 The building was the location of Dodds the Printers in 1986 who occupied numbers 193 and 195. I am not sure when the business closed in King’s Cross Road, however I believe it was relatively recently. The shop front has changed and the lovely signage above the shop has disappeared, however the terrace of 19th century buildings are much the same. On the right side of both photos is an alley disappearing through the buildings. This is St. Chad’s Place. 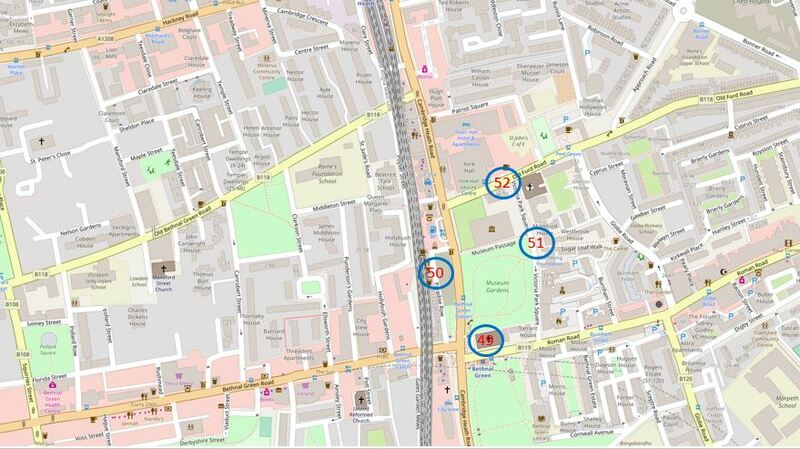 The following extract from OpenStreetMap shows the location. 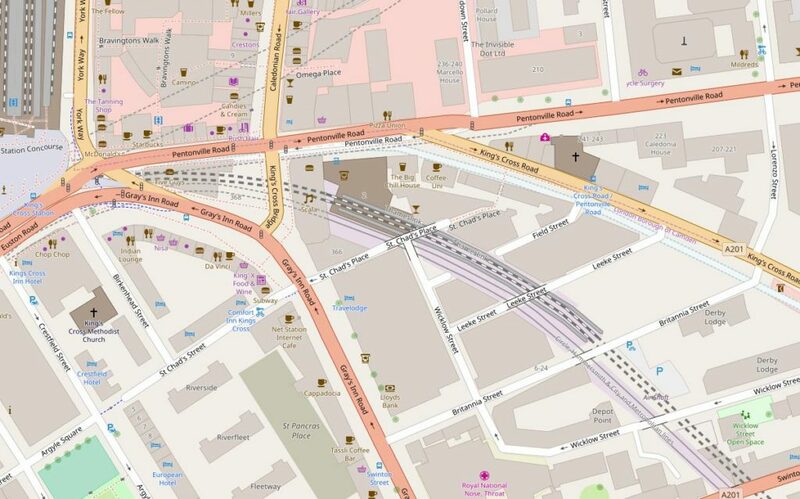 St. Chad’s Place can be seen running left to right in the middle of the map – suitable for vehicles to just after crossing the rail lines where it turns into a pedestrian alley, with a sharp bend and a narrow stretch running up to King’s Cross Road. Walking into St. Chad’s Place from King’s Cross Road, you first pass through the terrace lining King’s Cross Road before continuing down a narrow stretch between high brick walls. The alley passes a number of old brick, industrial buildings, gently rising in height. Half way along the alley there are high metal walls. This is where St. Chad’s Place passes over a railway. It is just possible to peer over the top of the metal walls and look at the railway beneath. This is the original Metropolitan Railway, built between 1859 and 1862, which ran from Paddington to Farringdon. 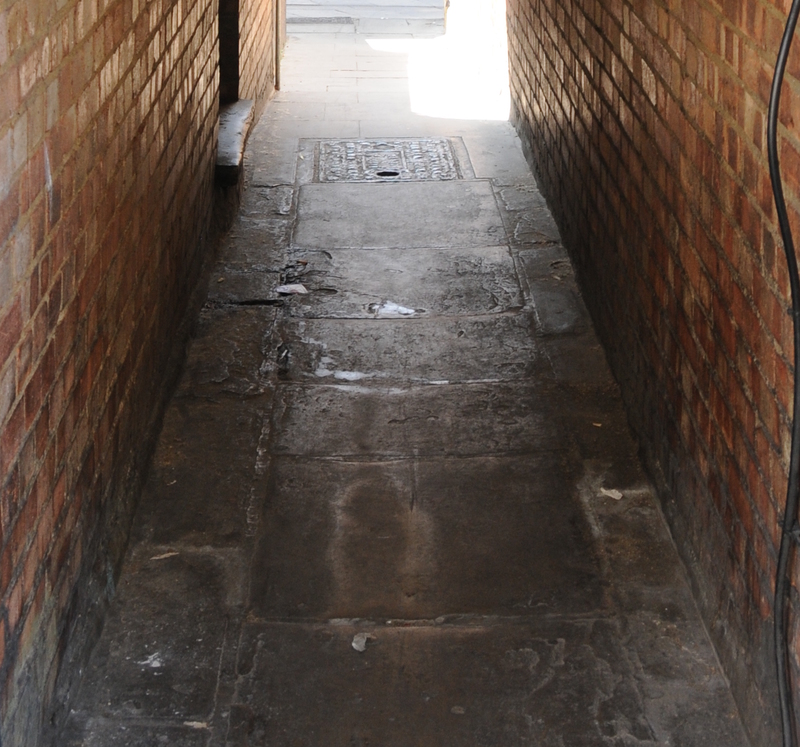 The railway was built below street level, using a mix of cut and cover, as well as leaving the railway in an open cutting, as in the stretch that passes underneath St. Chad’s Place. The route today is used by Thameslink trains and the London Underground Circle, Metropolitan and Hammersmith and City lines. 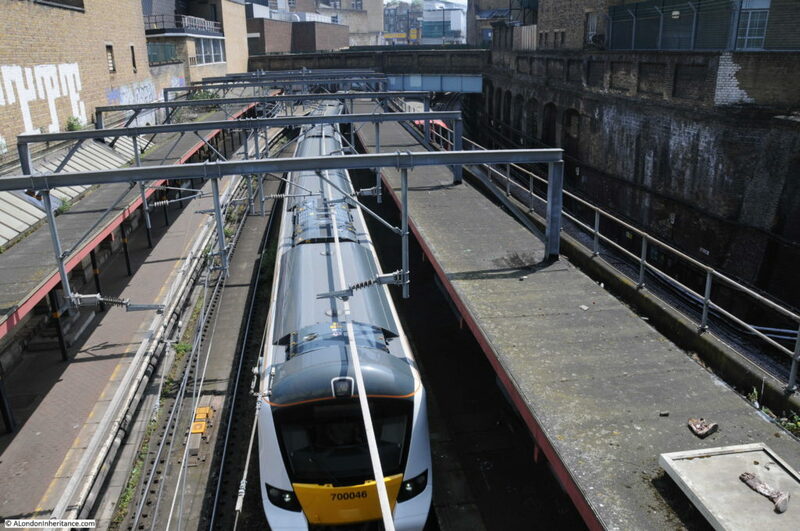 In the following photo, looking south towards Farringdon is a Thameslink train, with the red of an underground train just visible to the upper right. 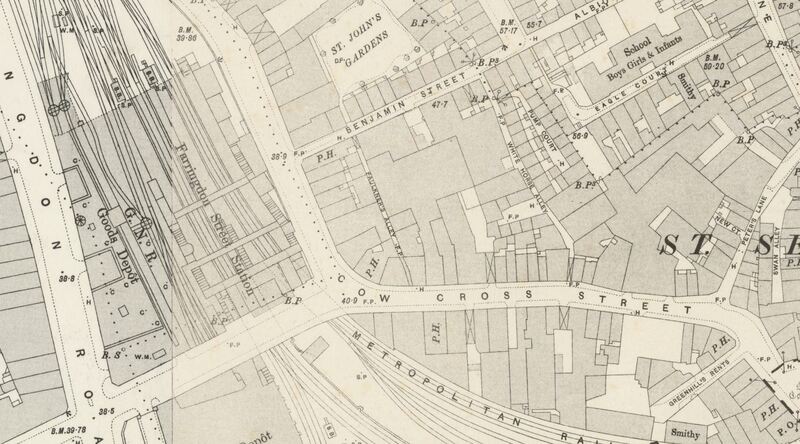 The railway cuts a wide path between King’s Cross and Farringdon, but for the most part is not that visible. 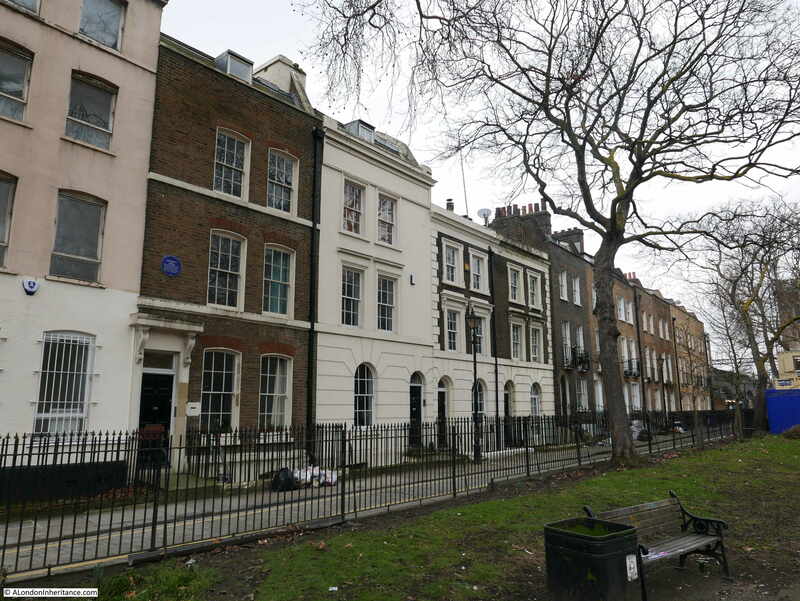 Walking along King’s Cross Road or Gray’s Inn Road, you would not know there is a railway running close by, it is only when you walk through the streets between these major roads that you pass over, and get a view of the cutting through this part of the city. The building of the railway must have been very disruptive to the area. Streets were cut off and before construction of the railway could start, demolition of hundreds of houses, factories, warehouses and workshops was required. Walking up towards Gray’s Inn Road, this is the view back down St. Chad’s Place. 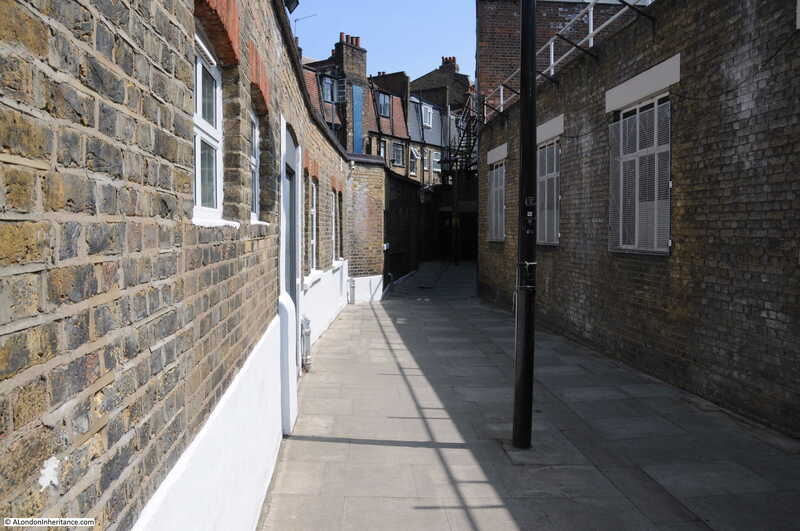 A narrow, cobbled roadway in the centre, sloping down to where the blue metal wall of the railway can be seen on the right. The black sign on the left is for Meat Liquor bar and restaurant, probably the main reason for anyone to walk down St. Chad’s Place. Apart from the person sitting outside the restaurant, I did not see anyone else walk through for the whole time I was in St. Chad’s Place. At the top is the junction with Gray’s Inn Road. A walk through St. Chad’s Place is a glimpse of the many old alleys that once ran between major streets (I will be writing about one that is in the process of disappearing in a future post), and the view of the railway provides an insight into what is just below London’s surface, however, as usual, there is always more to discover. Starting with the name, St. Chad’s Place, this is an indication of what was once here. The route of the River Fleet was once alongside where King’s Cross Road now runs, and the geology of the area gave rise to a number of springs at Bagnigge Wells, Clerks’ Well (Clerkenwell), and a St. Chad’s Well. All running close to the River Fleet. 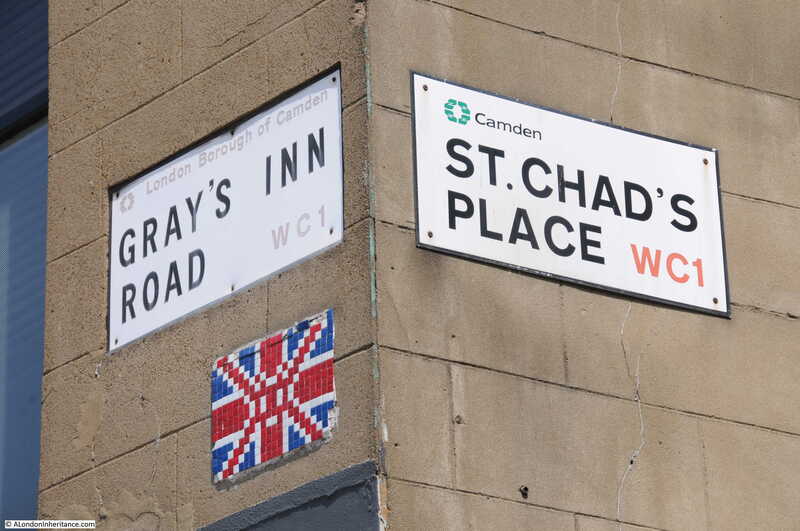 St. Chad’s Well was to be found at the junction of St. Chad’s Place and Gray’s Inn Road. The well was very popular in the middle of the 18th century, with around 1,000 visitors a week travelling along Gray’s Inn Road to take the waters. “St. Chad’s Wells – Health restored and preserved, by drinking the Battle-Bridge Waters, commonly called St. Chad’s Wells, formerly dedicated to St. Chad, first Bishop of Lichfield. These Waters are recommended by the most eminent Physicians as the best Purging Waters in England, they are found highly efficacious in removing all Complaints which affect the Urinary Passages such as Stone, Gravel, etc, They likewise cure the Scurvy, Bile, Worms, Piles, Indigestion, Nervous Complaints, Seminal Weaknesses, and various other Disorders too numerous for an advertisement. Several attestations of their wonderful Effects may be seen in the Pump room. The name Battle-Bridge Waters refers to the Battle Bridge, a brick arched bridge over the River Fleet just north of St. Chad’s Place. The name Battle Bridge is often taken to refer to a battle fought here between Boadicea and the Roman army, however this is very unlikely as the name in medieval manorial court rolls was Bradeford Bridge. Chad refers to a 7th century Mercian churchman who founded the first monastery in Lichfield. St. Chad allegedly preached at Stowe, just outside the centre of Lichfield , and a medieval St. Chad’s Church was built at Stowe along with a holy well with St. Chad’s name. 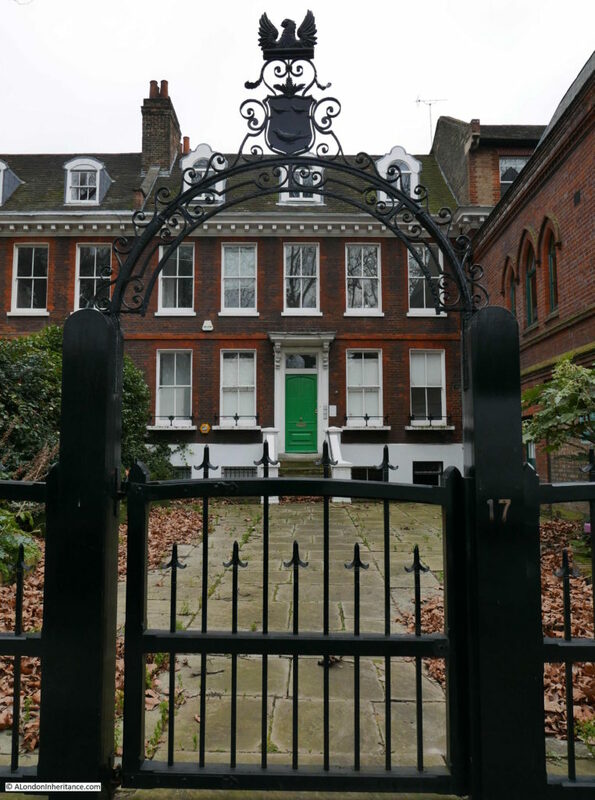 This association with a well could be why the well in Gray’s Inn Road took St. Chad’s name – a more virtuous, health promoting name than Battle Bridge. The following print from 1850 show the St. Chad’s Well pump house, built close to Gray’s Inn Road. 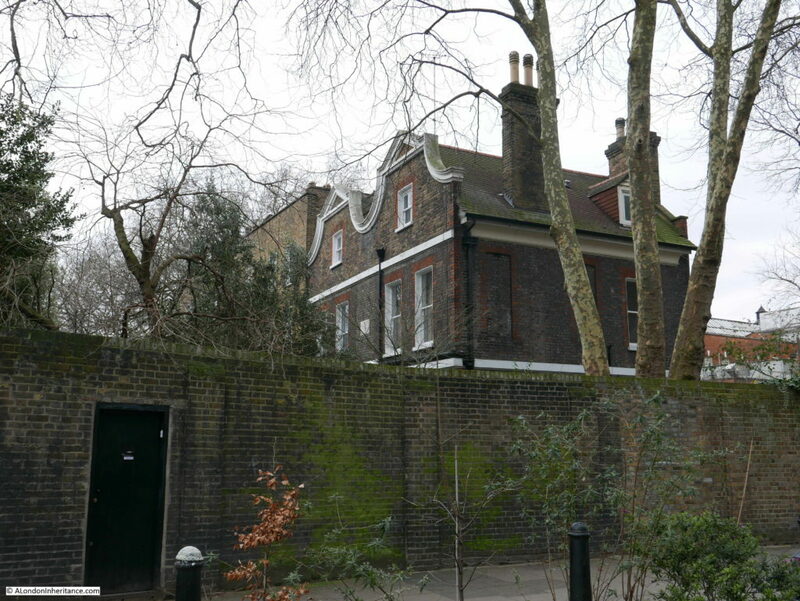 At the rear of the house, gardens stretched back towards King’s Cross Road. By the time of the above print, the well was declining in popularity. 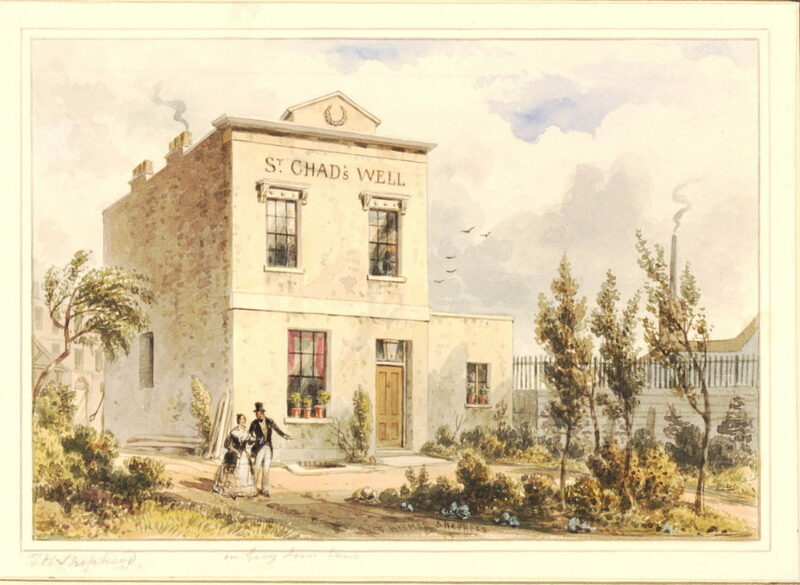 I cannot find exactly when St. Chad’s Well closed, however St. Chad’s Place was built over part of the garden in 1830 and the majority of the gardens were lost in 1860 when the Metropolitan Line was built. I suspect it was the building of the railway which finally swept away the well. Now this is where this post starts to get very speculative. I am sure though of the route of the River Fleet. I have checked a number of sources, including the book “The Lost Rivers of London” by Nicholas Barton and Stephen Myers (a well researched and illustrated history of London’s lost rivers and their routes through the city) as well as “The History of the River Fleet” by the UCL River Fleet Restoration Team, and they all show the River Fleet running along the western edge of King’s Cross Road, under where St. Chad’s Place meets King’s Cross Road. The River Fleet is also shown on the OpenStreetMap extract, running parallel to King’s Cross Road. St. Chad’s Place descends very gradually as you head from Gray’s Inn Road towards King’s Cross Road, which could be expected for a spring rising near Gray’s Inn Road running through the gardens of the pump-room and down to the River Fleet. As I walked along St. Chad’s Place, the sunlight glinting off running water below a small grating in the middle of the cobbled street caught my eye. It was hard to judge the depth, but it must have been around 10 to 15 feet below the road surface. It looked to be a fast flow of clean water, and yes I did take a sniff and it did not smell like a sewer. I have no evidence to support this, apart from the view through the grating, however it is interesting to imagine that perhaps the waters of the St. Chad’s Well still rise here, and run along St. Chad’s Place, heading towards the River Fleet. 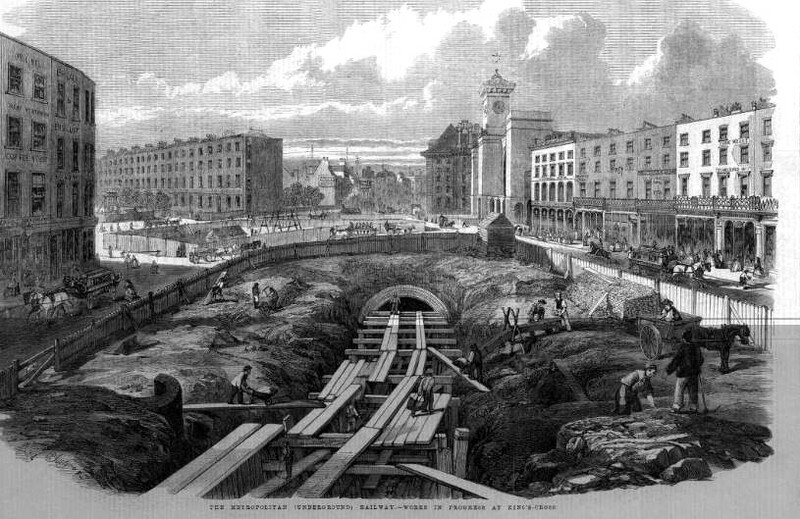 They would now be cut off by the cutting made for the Metropolitan Railway, however perhaps there is a pipe that carries them across, or a separate sewer that runs along the western edge of the railway. Walking back towards King’s Cross Road, and where St. Chad’s Place passes through the building facing King’s Cross Street, there is a run of old paving slabs, and an old manhole cover. This is exactly where the River Fleet is shown to run parallel to Kings Cross Road. 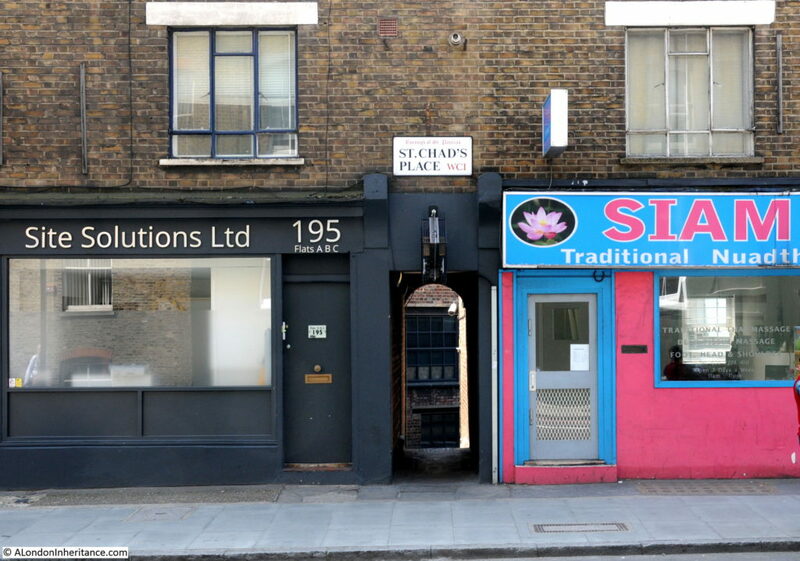 If you walk past 193 and 195 King’s Cross Road, take a detour into St. Chad’s Place. 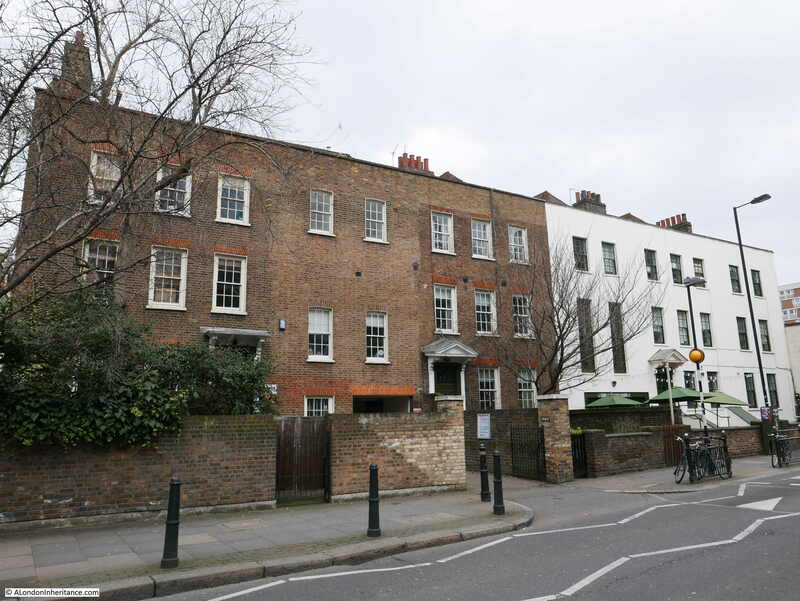 Walk up to Gray’s Inn Road and you will cross the River Fleet, the original Metropolitan Railway and the site of St. Chad’s Well – not bad for a couple of minutes walk. 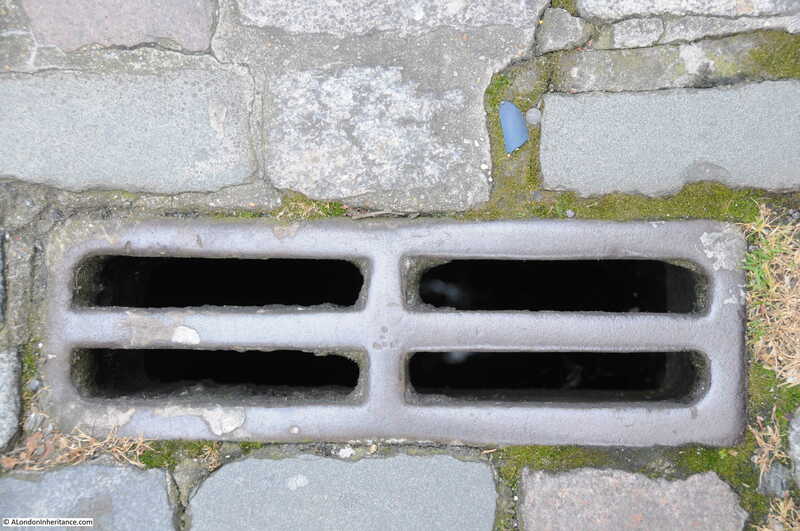 And with some imagination, perhaps you will also see the waters of St. Chad’s Well still running beneath a small, four hole grating. This entry was posted in London Streets, Under London and tagged Gray's Inn Road, King's Cross Road, St. Chad's Place, St. Chad's Well on June 3, 2018 by admin.